Minister of Education and Science, Dimitri Shashkini attended the gala concert of the festival of Georgian song that was held in memory of Gogi Dolidze. 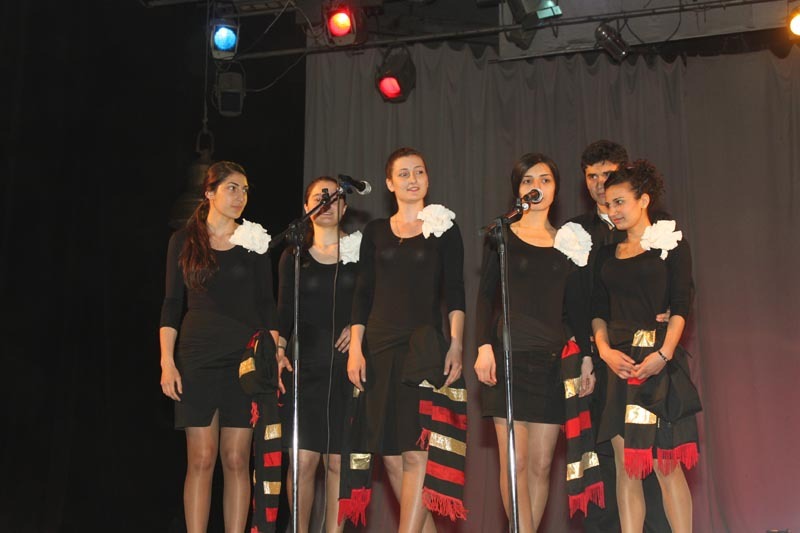 Song festival was held for the fourth time by the initiative of the principal of Tbilisi Public School №24, Gia Murghulia. It was held among the school children of 10-17 ages. 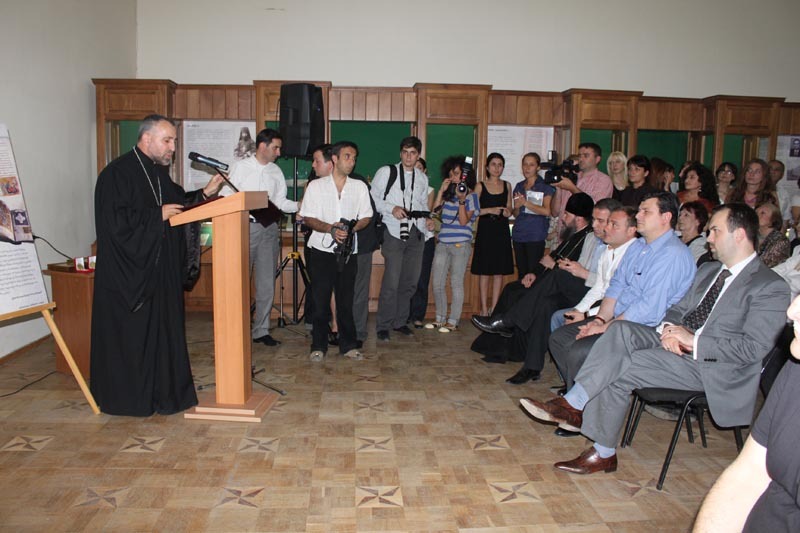 The foundation day of National Manuscript Center was celebrated on June 30. Events were held in the scope of this day at the center. 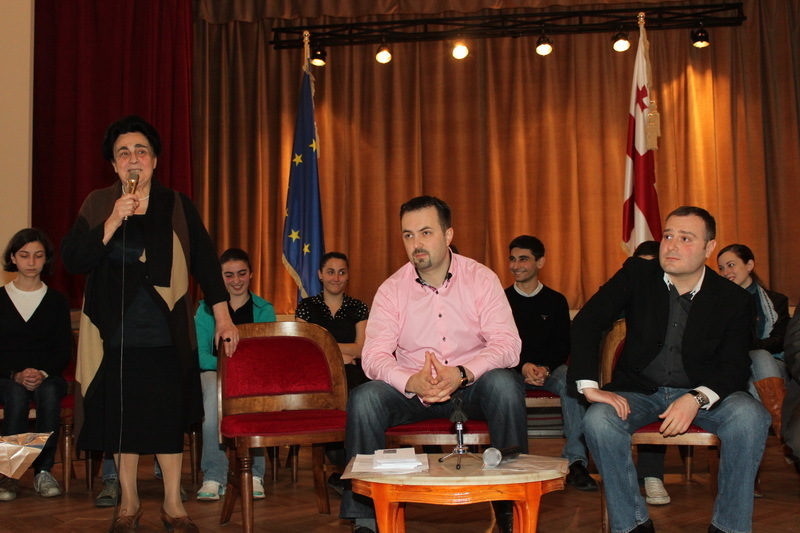 Minister of Education and Science, Dimitri Shashkini and many honorable guests participated in the event. 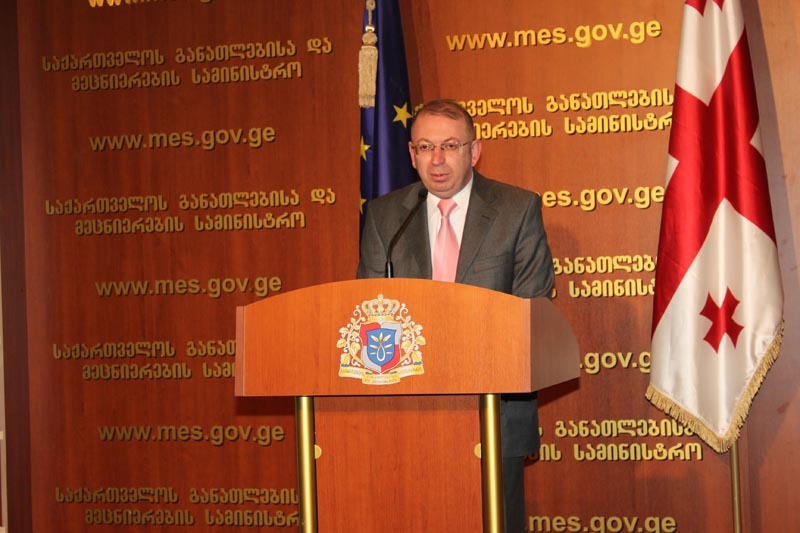 First Deputy Minister of Education and Science, Akaki Seperteladze and Director of National Examination Center, Maia Miminoshvili held a first briefing on 2010 Unified Entry Exams at the media center of Unified Entry Exams. Minister of Education and Science, Dimitri Shashkini and Manager of Microsoft Program in Central and Eastern Europe - Forum of Innovative Teachers 2010, Teodor Milev participated in the summarizing conference and awarded the winner teachers with prizes and certificates. Minister of Education and Science, Dimitri Shashkini, Rector of Iv.Javakhishvili Tbilisi State University, George Khubua and Director of National Scientific Library, Irakli Gharibashvili attended the award ceremony of 62 specialists of TSU library. Librarians were awarded with certificates. Another round of discussions of School Principals’ Professional Code of Ethics was held at MES. 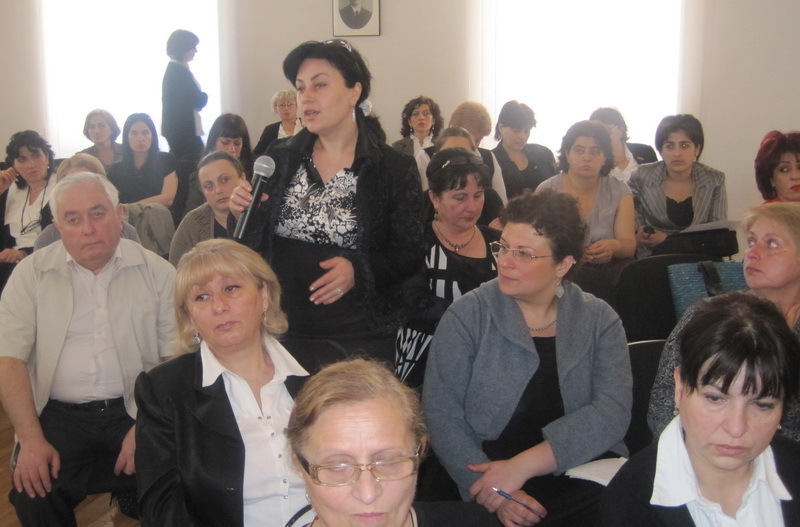 This time, Director of Teacher Professional Development Center, Gia Mamulashvili, around 50 principals and teachers of different regions of Georgia as well as representatives of NGOs and Public Board participated in the event. Minister of Education and Science, Dimitri Shashkini and Minister of Finance of Georgia, Kakha Baindurashvili met with the Rectors of Higher Educational Institutions and introduced them the planned amendments in the Tax Code. 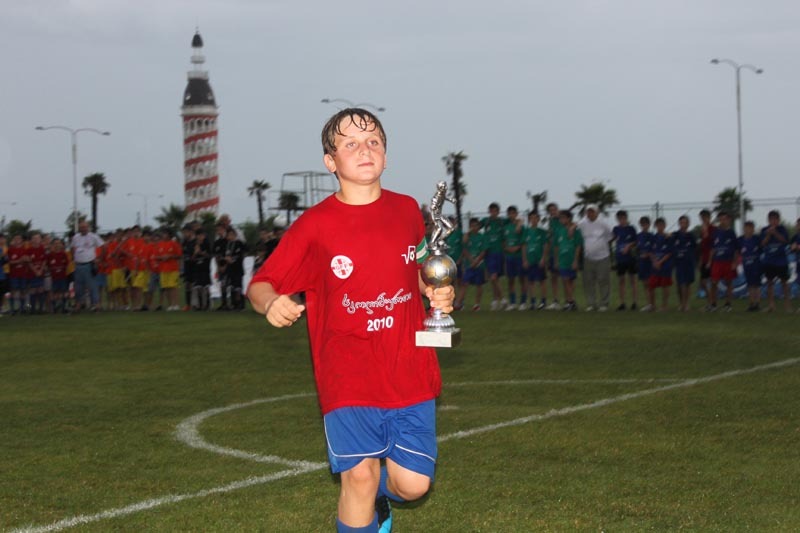 The final match of School Ball was held among Zugdidi Public School №5 and Bolnisi Public School #1 on Adjara Coast, in Batumi. 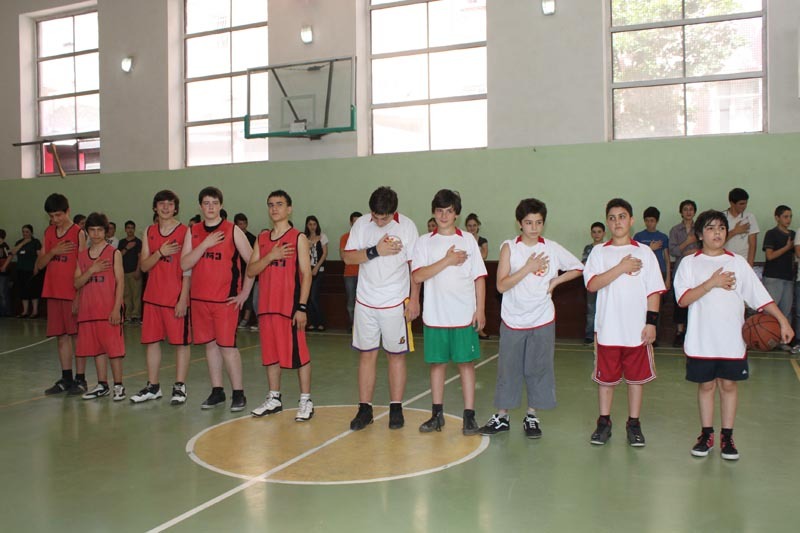 The team of Zugdidi Public School №5 won the match. The score was 3:0. Two-day seminar was held in the tourist complex in Daba Chakvi for the representatives of media. 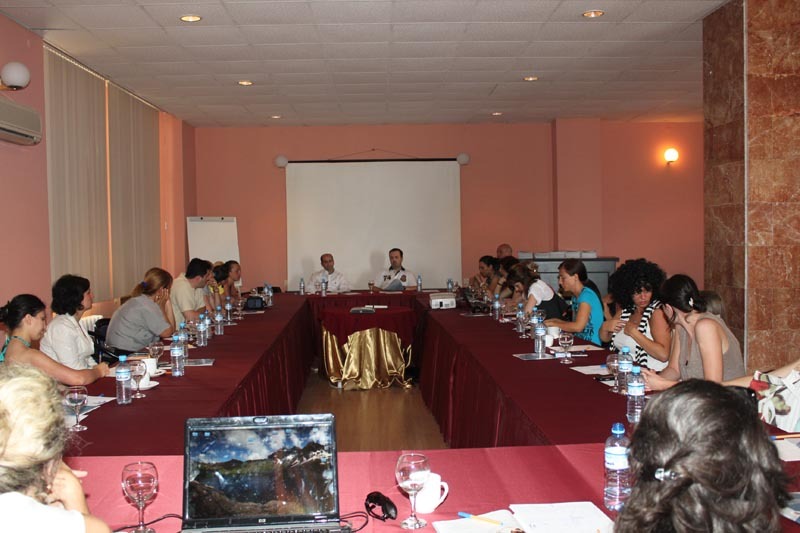 Around 30 representatives of TV, radio stations and newspapers participated in the seminar. 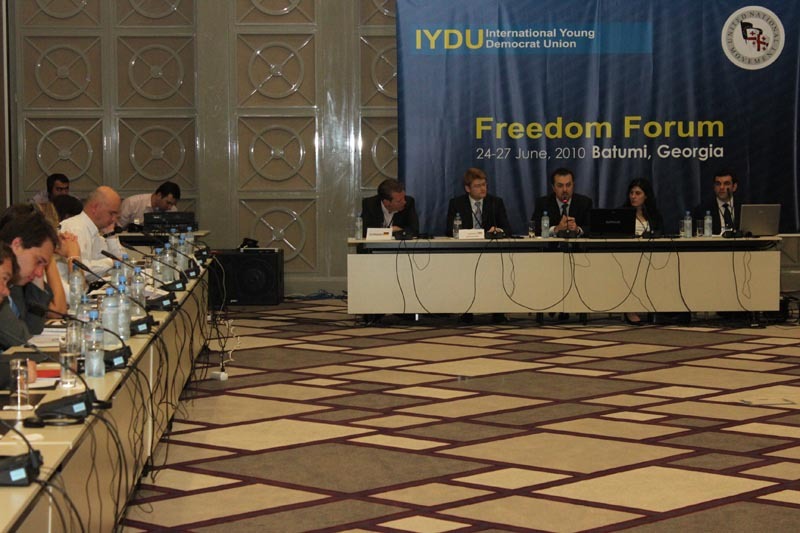 International Conference “Forum of Freedom” is being held on June 24-27 in Batumi that organized by United National Movement. The President of Georgia opened new Caucasian French School. Minister of Education and Science of Georgia and Ambassador of Republic of France to Georgia Erik Fournier attended school opening ceremony. 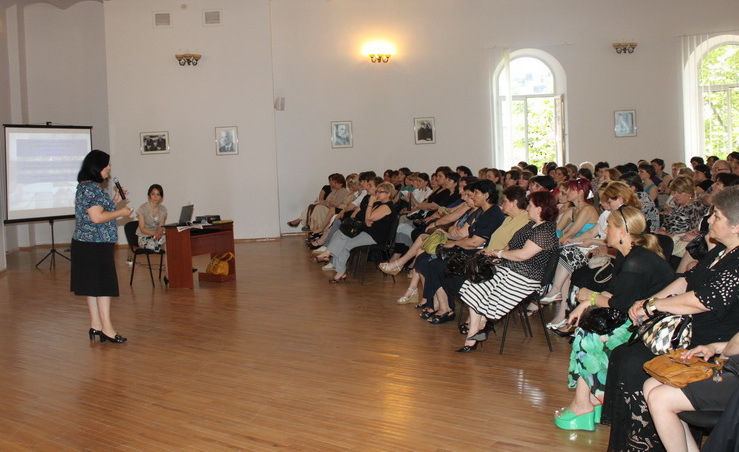 Award ceremony of the volunteer students who participated in the competition We Study Together was held at the exhibition hall of Tbilisi State Academy of Arts in the framework of the project Development of Inclusive Education in 9 Regional Public Schools. For the first time, MES identified the best student, teacher, school principal, public and private schools and the Head of resource center of the year. 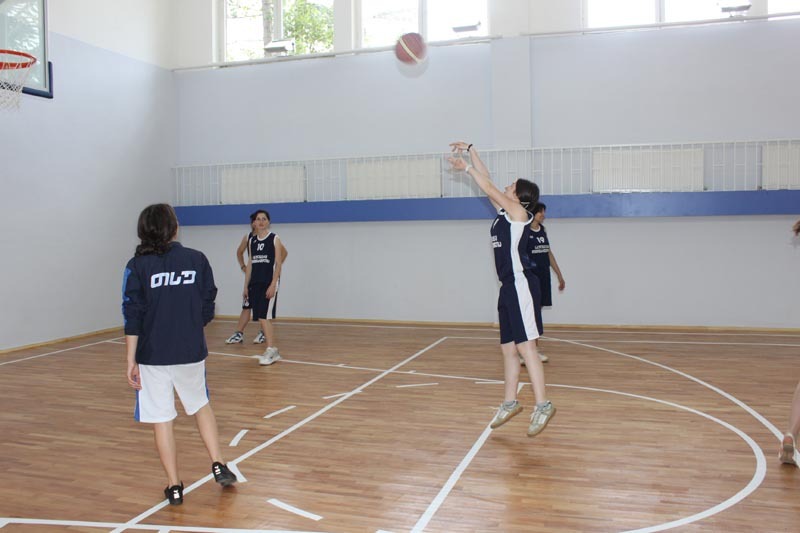 Minister of Education and Science, Dimitri Shashkini opened a new gym of the tenth building of TSU and announced about foundation of University Basketball League. Minister of Culture, Monument Protection and Sport, Nikoloz Rurua, President of Basketball Federation, Besik Liparteliani and Rector of TSU, Giorgi Khubua participated in the event. 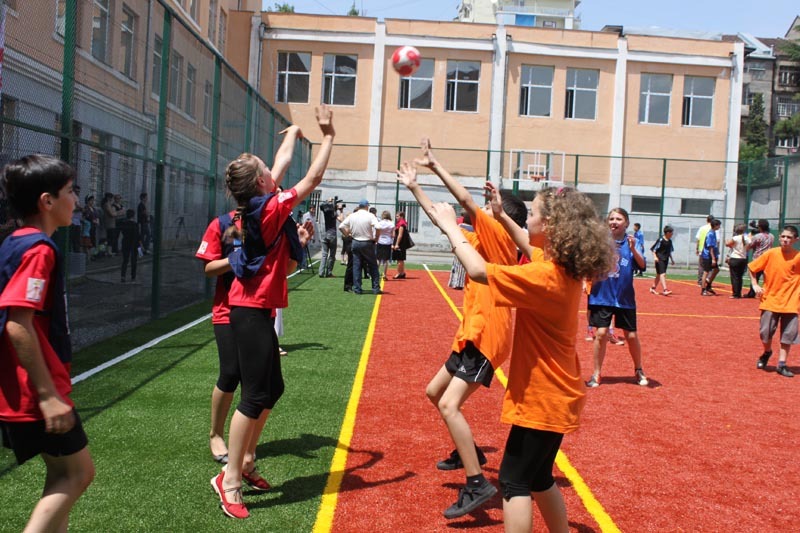 Minister of Education and Science, Dimitri Shashkini opened a stadium in Tbilisi Public School №165. Education and Science Infrastructure Development Agency of MES implemented the construction workings of the stadium that is in compliance with modern standards. 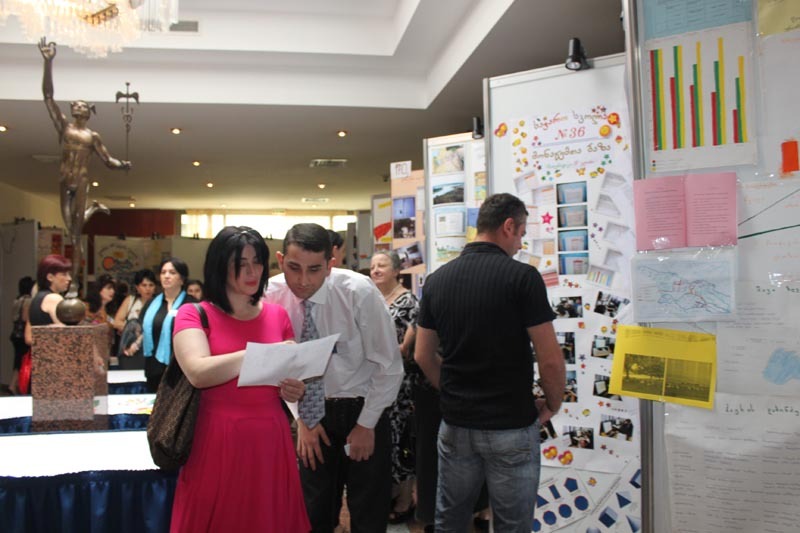 Minister of Education and Science, Dimitri Shashkini opened the third level (10-12 grades) school “Logos”. School that is staffed with high quality professionals will start functioning from the next academic year. 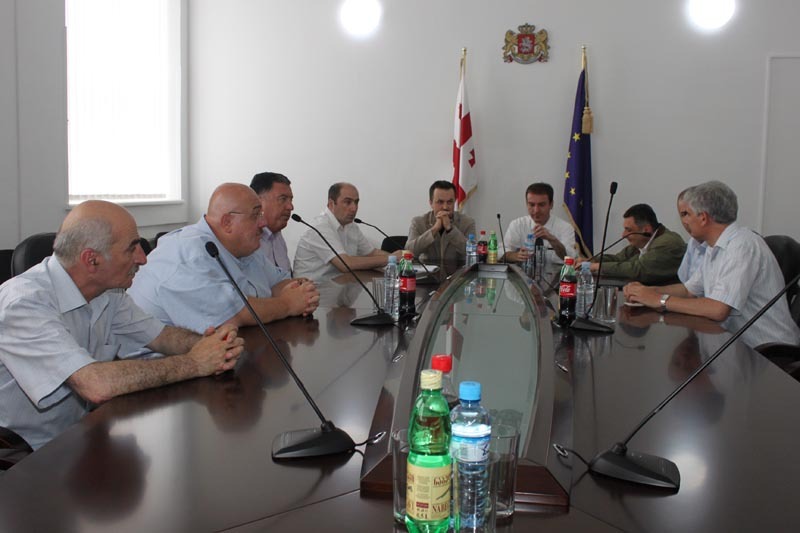 Minister of Education and Science, Dimitri Shashkini hold a working meeting on the school infrastructure improvement with businessmen and the Heads of banks. Discussion of School Principal Professional Code of Ethics was held at MES. Deputy Minister of Education and Science, Irine Kurdadze and Director of Teacher Professional Development Center, Gia Mamulashvili took participation in the working meeting. Minister of Education and Science, Dimitri Shashkini attended the conference Educational Reform – Challenges and Initiatives seen from Public Point of View. Conference was organized by Education Alliance of Georgia. 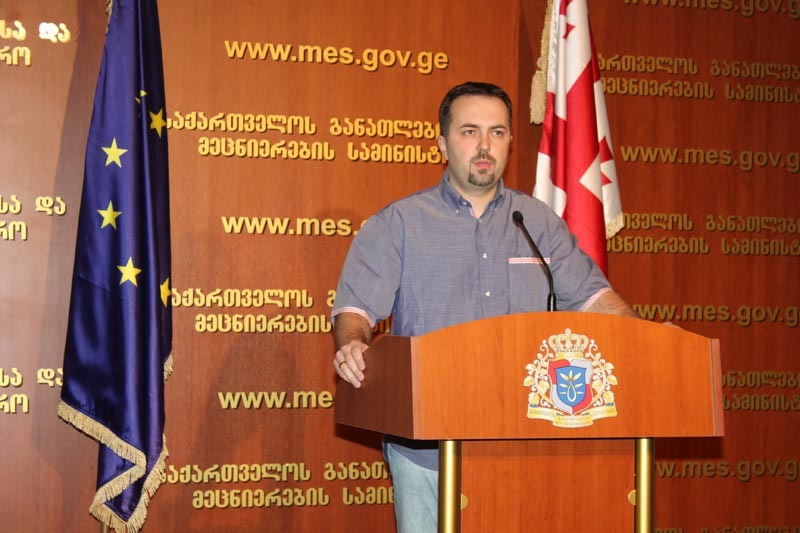 Minister of Education and Science, Dimitri Shashkini held a briefing on the false information about teachers’ dismissal. By the announcement of the Minister, in the recent period, false information was spread by one of the organizations that MES plans to dismiss teachers. 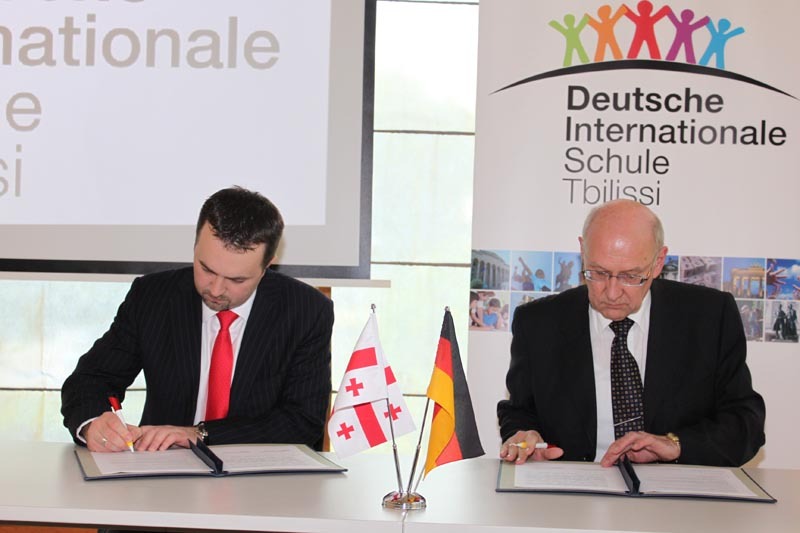 Minister of Education and Science, Dimitri Shashkini and Ambassador of Federal Republic of Germany to Georgia, Ortwin Hennig signed a declaration on cooperation and foundation of German International School in Tbilisi. 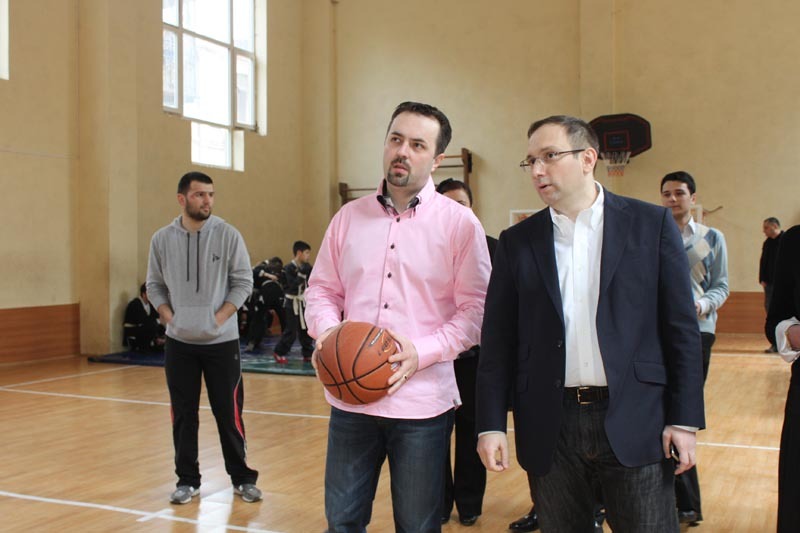 In the framework of the President’s initiative about replacing physical fitness lessons with sports classes, final match in basketball among 7th and 8th graders was held in Tbilisi Public School №51 in order to identify winners of the basic level. 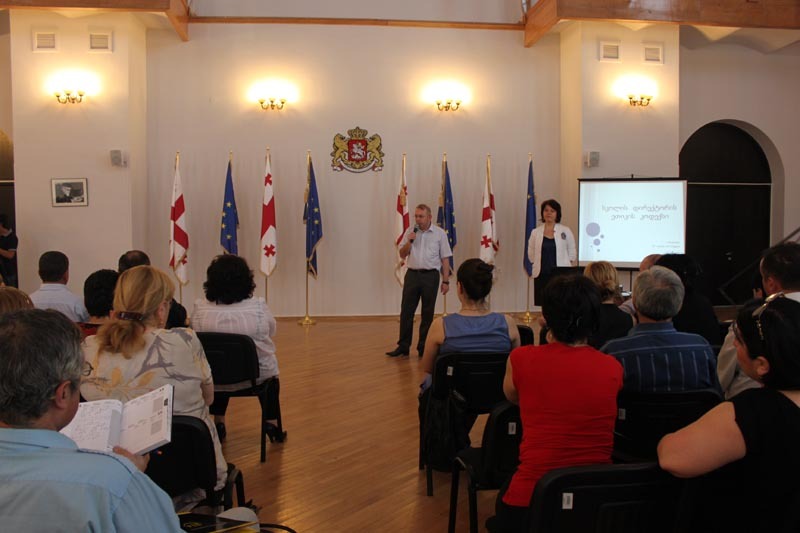 The Ministry of Education and Science of Georgia together with the National Centre for Education Accreditation has launched a series of Regional Academic Summits and trainings for higher educational institutions in the framework of the Twinning/CEIBAL project. 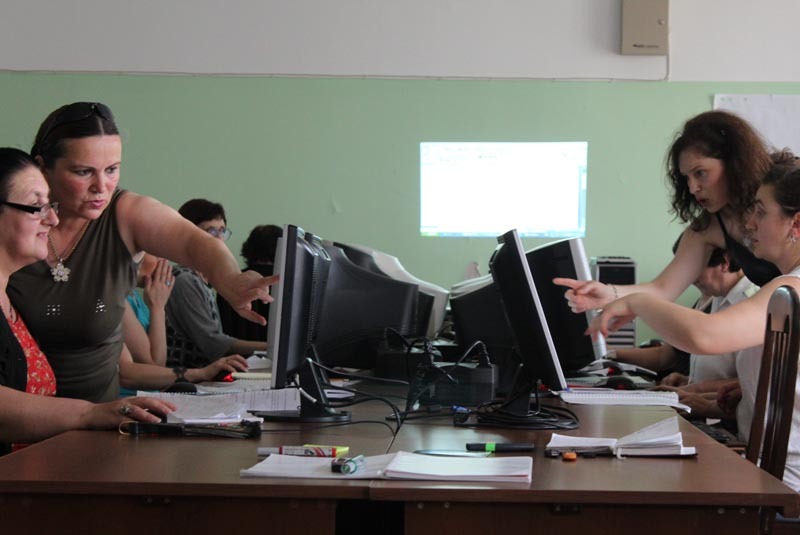 Deputy Minister of Education and Science, Irine Kurdadze and Director of Teacher Professional Development Center, Gia Mamulashvili got familiarized with the training process of IT teachers in Tbilisi Public School №187 where teachers of several schools are being trained as well. On International Day of Disabled People, Minister of Education and Science, Dimitri Shashkini visited Tbilisi №202 School for Blind and Visually Impaired Children and attended the school children’s concert that was dedicated to the end of the academic year. 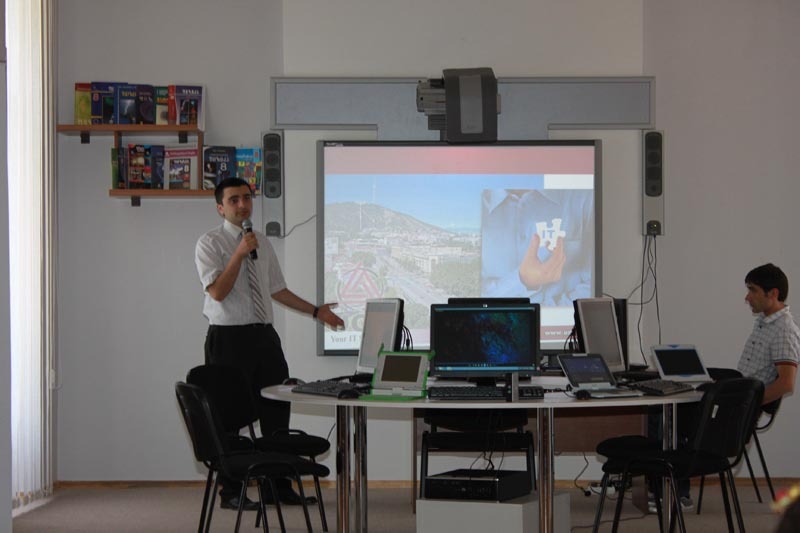 In the scope of the program Providing Schools with Computers and Equipping them with Modern Techniques, presentation of Innovative Center was held at MES. Center presents the model of future class room equipped with modern techniques: Interactive Electronic Board, computers, laptops and projectors. 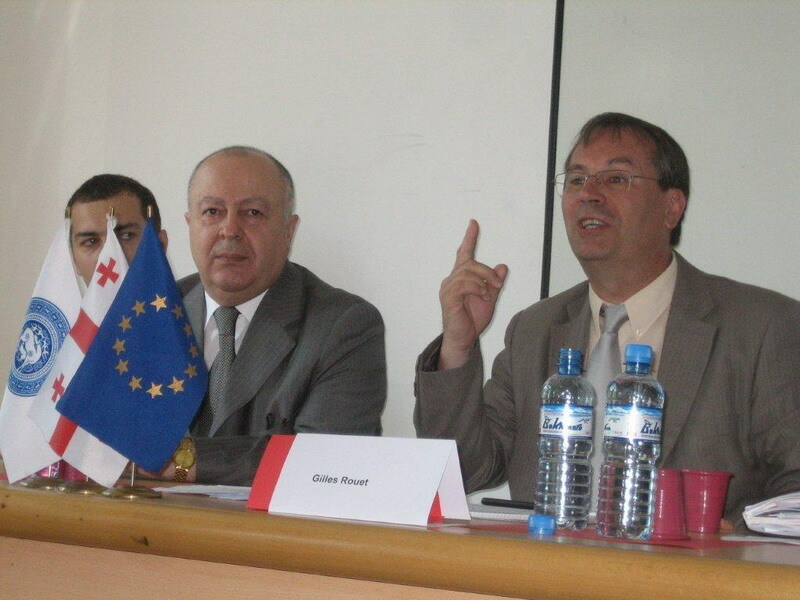 OnJune 10, 2010, Educators and Scientists Free Trade Union of Georgia, made afalse statement that, allegedly, the Ministry of Education and Science (MES) ofGeorgia interferes in the activities of the professional unions. In response,MES declares that these allegations are manifestly ill-founded and nointerference has taken place from the side of MES. 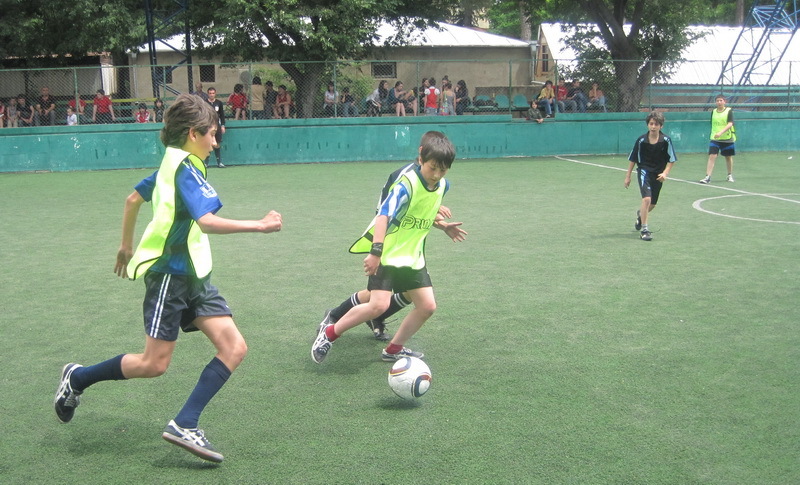 Football competition was held among the team of Tbilisi Public School №207 and musical group “Mgzavrebi” with the support of MES and Police Academy of Ministry of Internal Affairs. Working meeting of the representatives of NGOs and the members of Public Board was held at MES in order to discuss the draft plan of school children Code of Conduct. 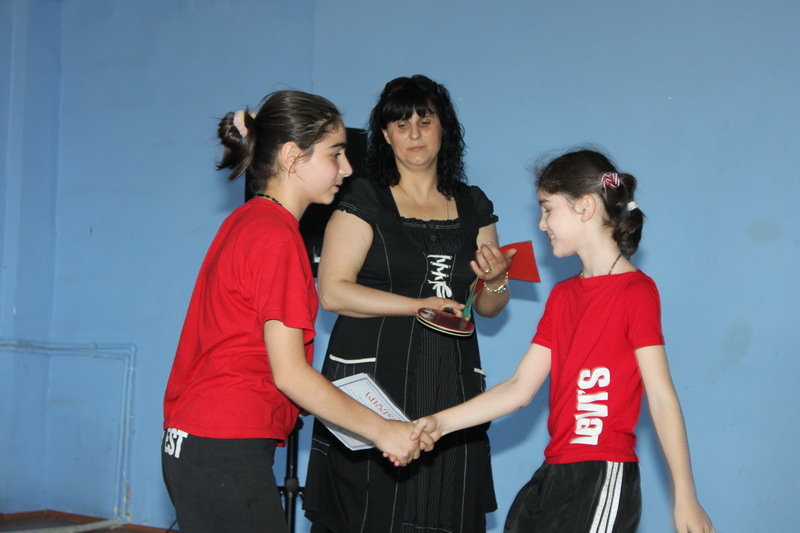 In the scope of the President’s initiative about replacing physical fitness lessons with sports classes, competition in table tennis and volleyball was held among the schools of Rustavi. 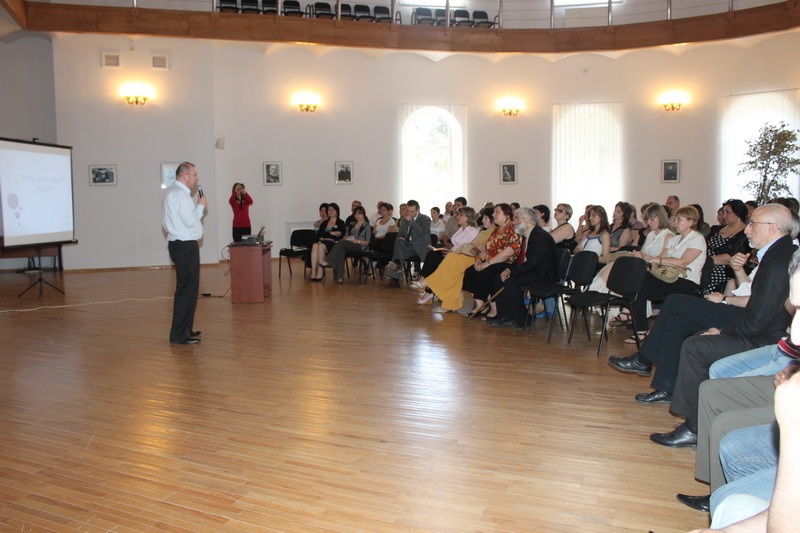 Minister of Education and Science, Dimitri Shashkini met with around 200 teachers of Tbilisi and regions and informed them about planned innovations for the next academic year. Minister of Education and Science, Dimitri Shashkini and General Director of Medical Insurance Group “Archimedes Global Georgia” Nikoloz Ramishvili attended the opening ceremony of the medical aid station in Public School №55 that is in compliance with modern standards. The Minister of Education and Science, Dimitri Shashkini opened a new swimming pool in Tbilisi Public School #186. Company “Royal 2009” implemented rehabilitative workings. This is the only swimming pool in Didi Digomi settlement. 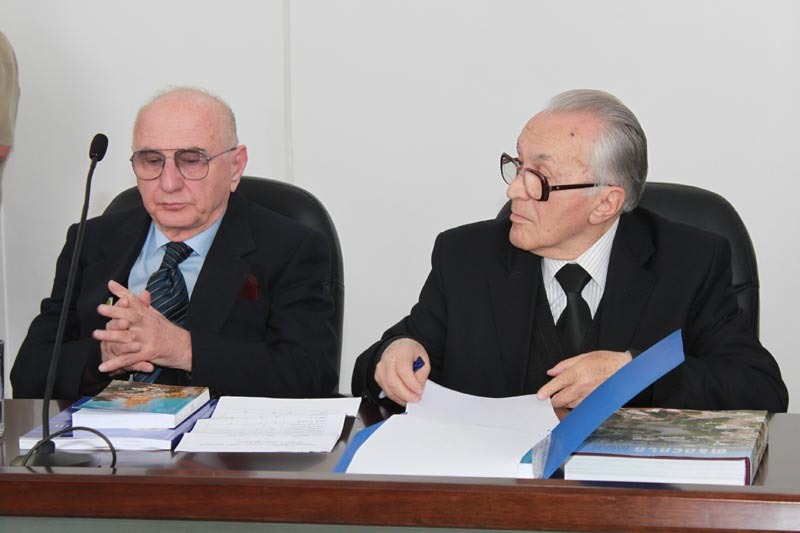 Minister of Education and Science, Dimitri Shashkini and Director of National Curriculum and Assessment Center, Natia Jokhadze introduced the results of textbook competition to the teachers and Principals of schools. 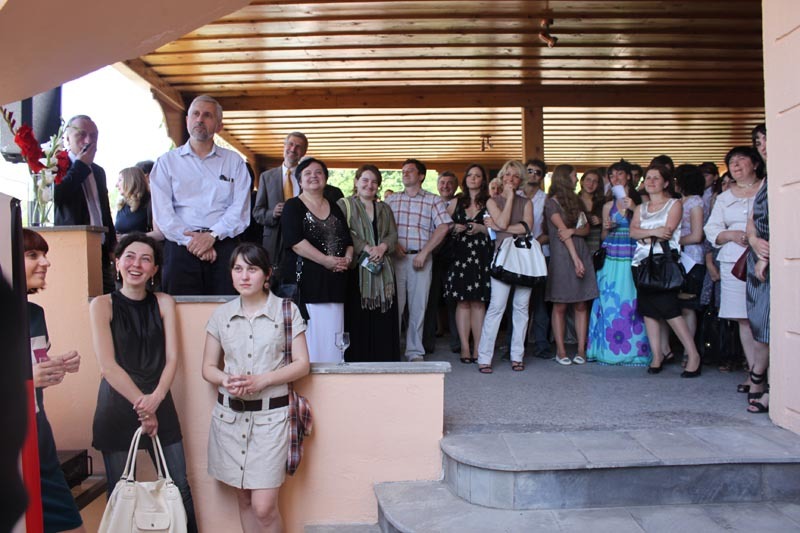 Deputy Minister of Education and Science, Nodar Surguladze and Ambassador of Federal Republic of Germany to Georgia, Ortwin Hennig awarded 94 Georgian youngsters with the internships of German Academic Exchange Service (DAAD) to study and research in Germany. 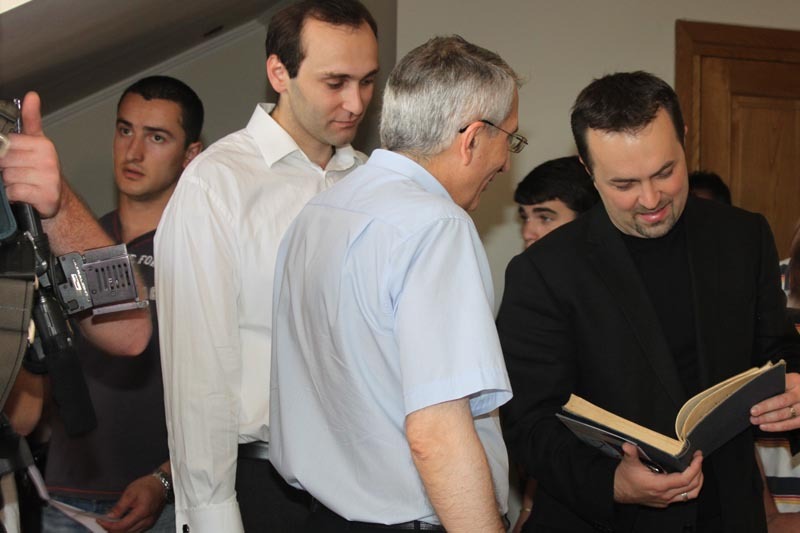 First Deputy Minister of Education and Science, Akaki Seperteladze visited ancient Georgian manuscript exhibition at Vekua Physics-Mathematical School №42 that was organized by the school children Club of Cultural Heritage and National Centre of Manuscripts. 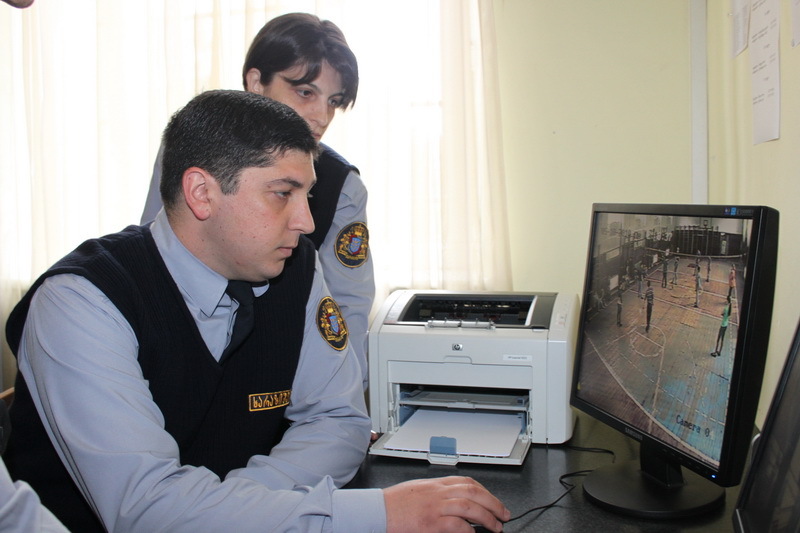 Minister of Education and Science, Dimitri Shashkini and the representative of the Ministry of Internal Affairs, Tamar Belkania visited Tbilisi private school “Tsiskari” and attended civil defense and safety lesson. 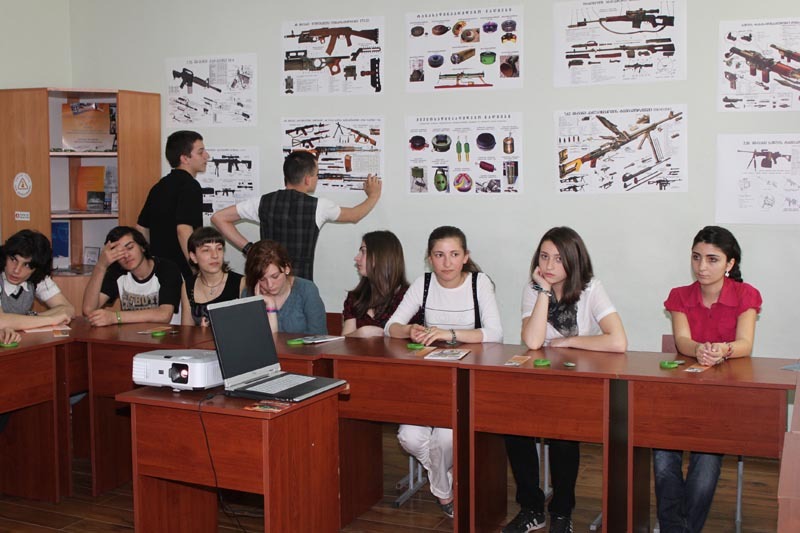 Students of this school will study history of Georgian army, review of Georgian armament, road safety and opportunities of civil defense. 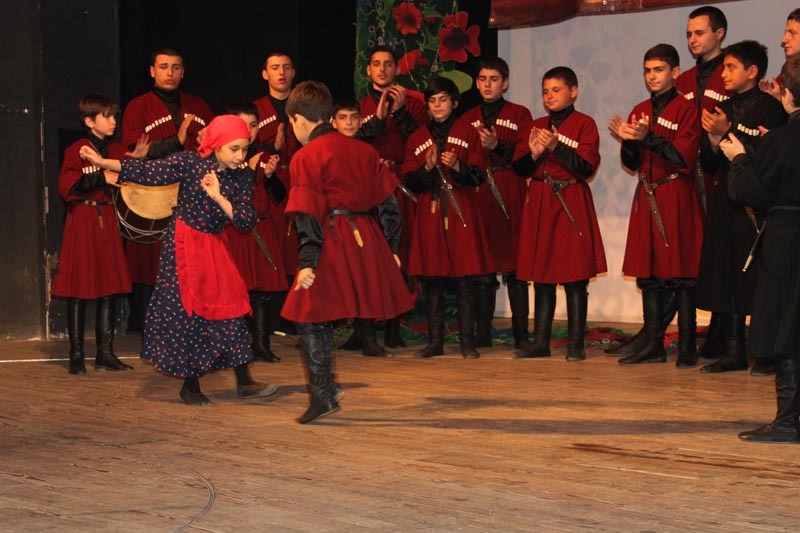 Renovated schools were opened in the villages of Kareli region – Dvani, Takhtisdziri and Dirbi. Rehabilitative workings were financed by USAID. 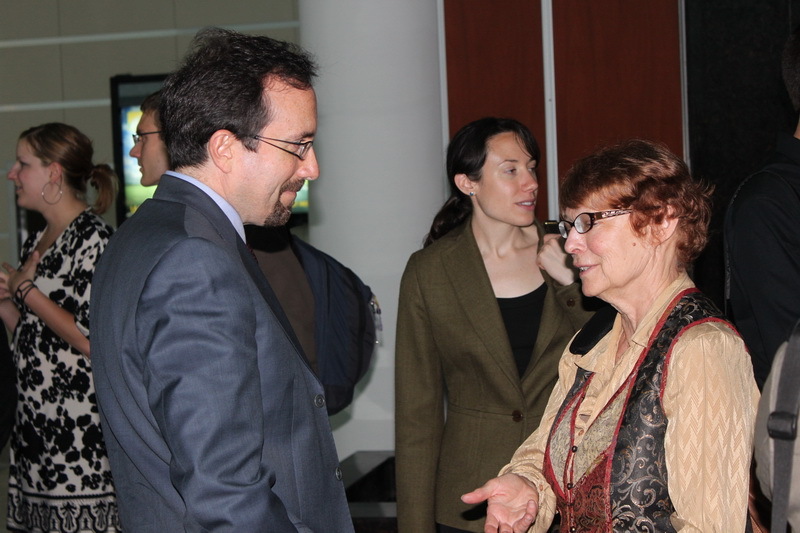 First Deputy Minister of Education and Science, Koka Seperteladze and Acting Director of USAID mission to Georgia, Ioakim Parker attended the school opening ceremony. 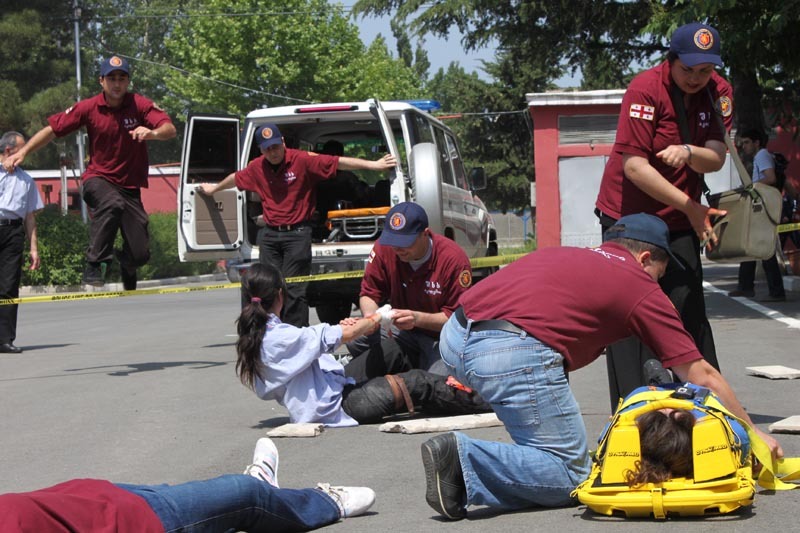 Rector of the Academy of the Ministry of Internal Affairs, Khatia Dekanoidze and Rector of Tbilisi State Medical University, Zurab Vadachkoria signed a memorandum that envisages giving the guards training courses in the first aid. Minister of Education and Science, Dimitri Shashkini attended the conference “It is Child’s Right to be Heard” that was organized by Public Defender and Child and Woman’s Rights Centre of Public Defender Office. 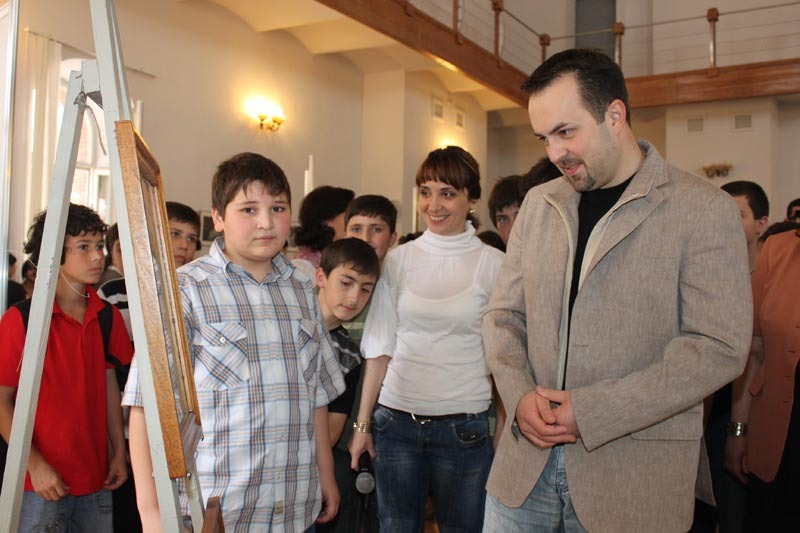 By the initiative of the Minister of Education and Science, Dimitri Shashkini, exhibition of school children paintings dedicated to International Children’s Day was held at the Ministry. Minister of Education and Science, Dimitri Shashkini visited Tbilisi Public School №203, congratulated the school children on International Children’s Day and presented them with different gifts. Minister congratulated all children on this day, wished them health and success in studying. 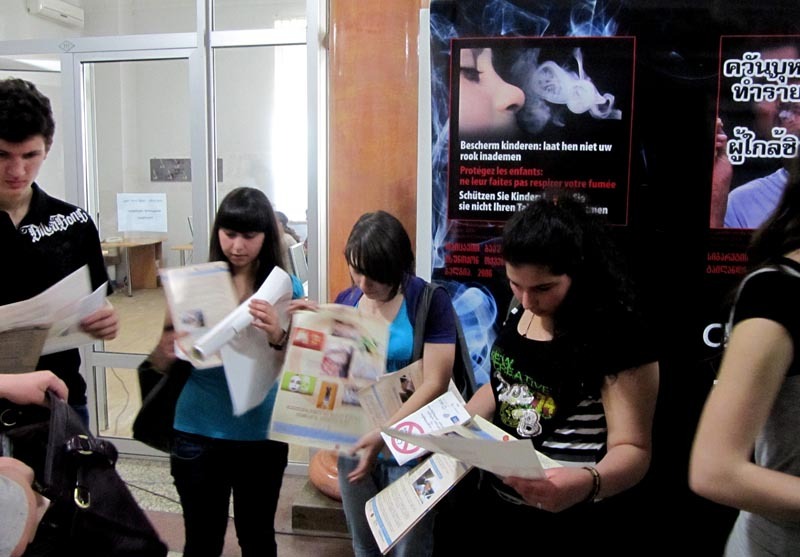 World no Tobacco Day was celebrated at I. Javakhishvili Tbilisi State University. Pictograms of different countries were exhibited in the hall of the second building of Tbilisi State University, booklets and flyers were distributed as well. Minister of Education and Science, Dimitri Shashkini, Ambassador of the United States of America to Georgia, John R. Bass and Ambassador of the Republic of France to Georgia, Eric Fournier attended Diploma Award Ceremony of graduates of 2010 of G.Zaldastanishvili American Academy. 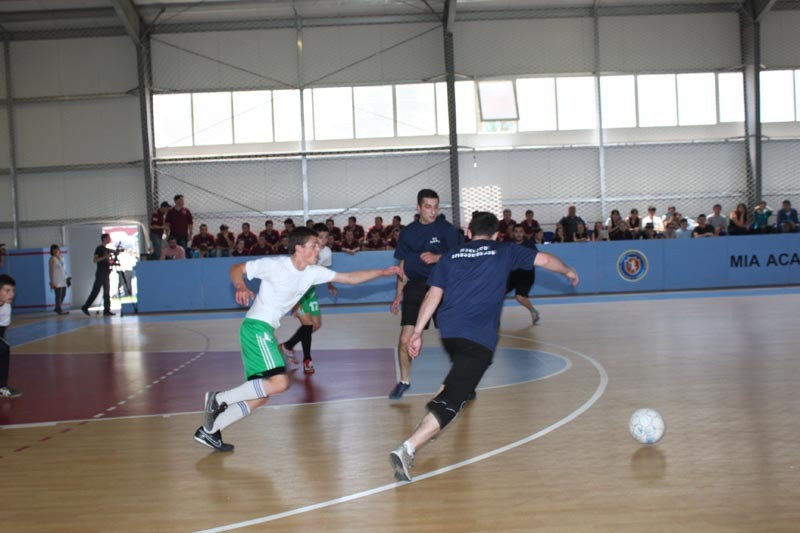 First Deputy Minister of Education and Science, Akaki Seperteladze and UEFA Hat Trick program manager, Joseph Clement attended ongoing football tournament among the school children of Vake-Saburtalo districts. Minister of Education and Science, Dimitri Shashkini, European Director of Business Development, Microsoft Public and Private Alliances, Dan MacFetridge and Intel Global Education Director for World Ahead, Brian Gonzalez signed an agreement in Batumi. Memorandum envisages close cooperation between the parties. 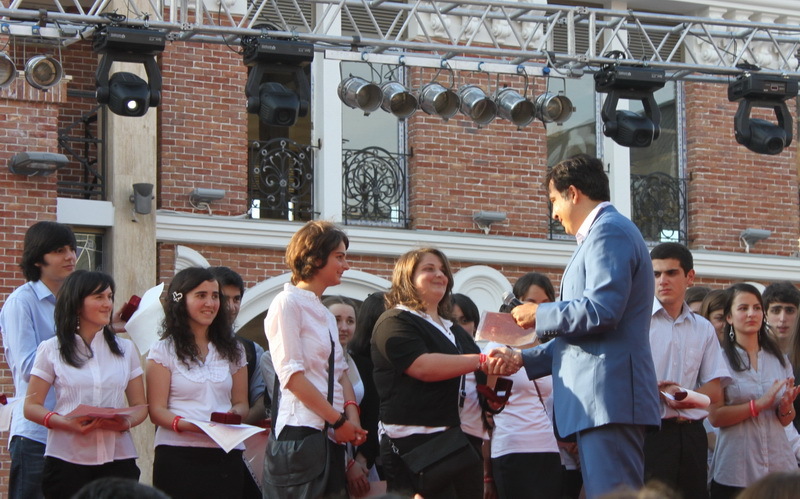 The President of Georgia, Mikheil Saakashvili met with the graduates of Batumi Public Schools. 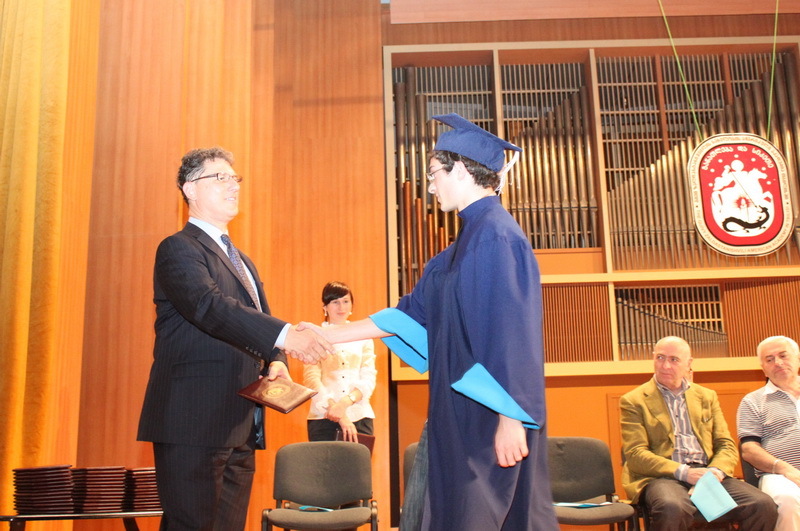 41 graduates of Batumi schools received Golden Medals and 74 - Silver Medals. The President of Georgia personally awarded 41 successful graduates with Golden Medals. 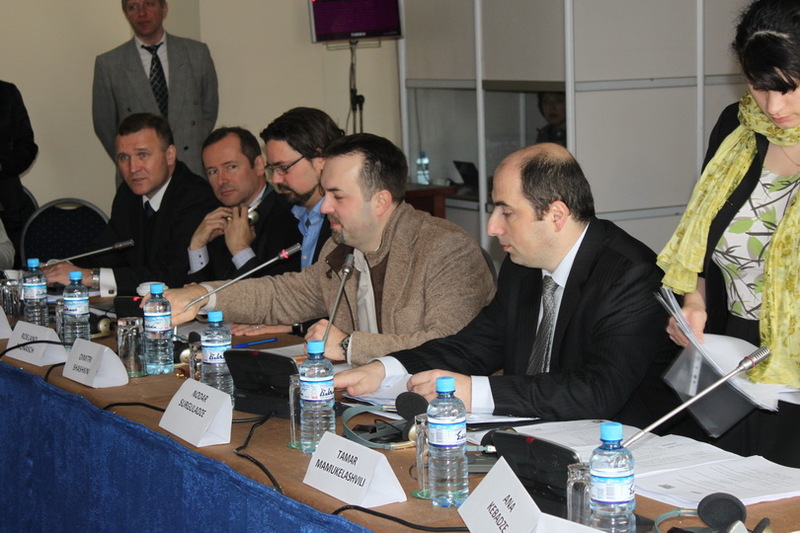 Representatives of USA, Canada, Ukraine and EU , who founded Science and Technology Center in Ukraine held their 2009 summary meeting in Tbilisi. 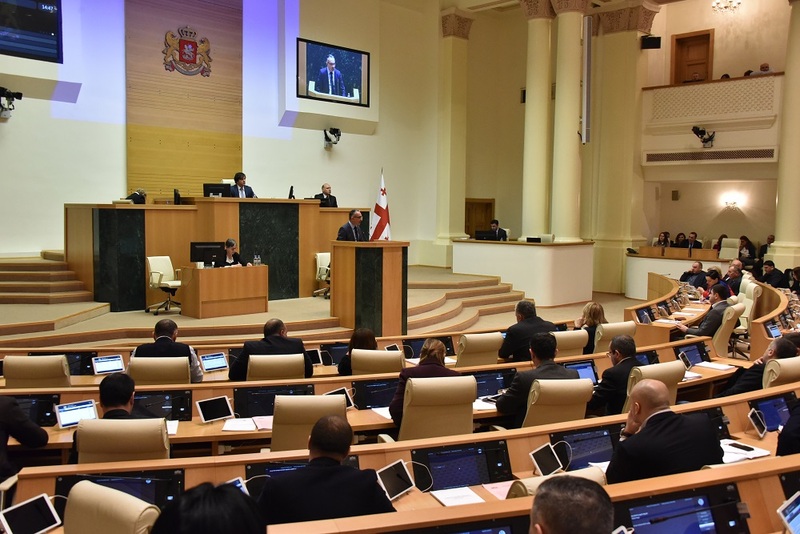 Public Board, established by the initiative of the Minister of Education and Science, Dimitri Shashkini discussed the draft plan of teachers’ professional ethics code. Opinions and notes of the members of the board will be considered in the final version of the code. Minister of Education and Science, Dimitri Shashkini attended the general school graduation event “Last Bell” in Rustavi Public School №24. He presented all successful school children of this school with portable computers. 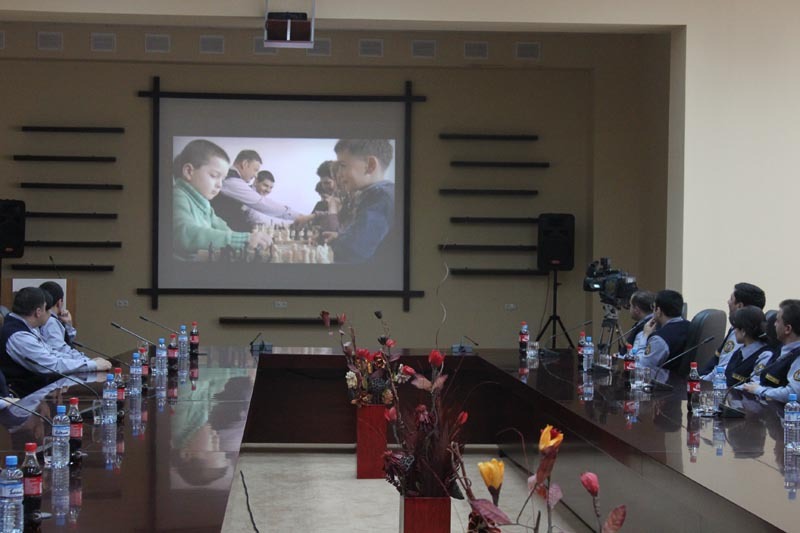 Head of General and Vocational Education Development Department of MES, Lali Ebanoidze presented the winners of the art competition Sadako – Ambassador of Peace with computers. The winners are: student of Tbilisi Public School №139, Nika Maghelani, student of Tbilisi Virsaladze Art School, Nodar Pirveli and student of Kutaisi Maisuradze Art School, Tamar Ioseliani. 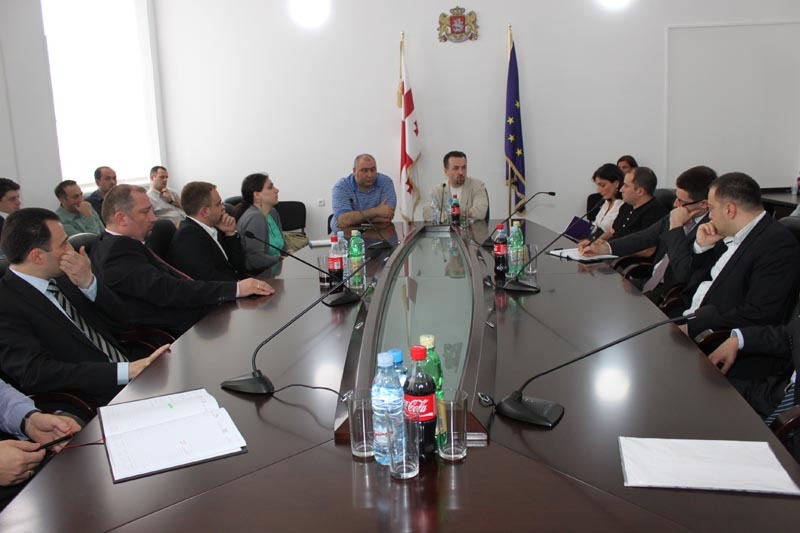 Minister of Education and Science, Dimitri Shashkini met with the teachers of Batumi Public Schools #10 and #12. Dimitri Shashkini spoke about ongoing educational reforms at the meeting and initiated to establish physics-mathematical school in Batumi. 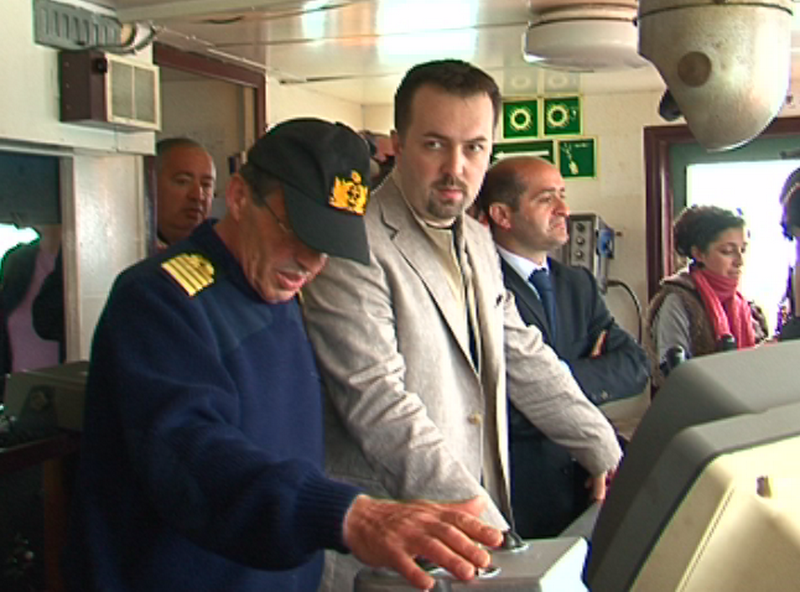 Minister of Education and Science, Dimitri Shashkini got familiarized with the teaching methodology of Batumi State Maritime Academy on the training ship. 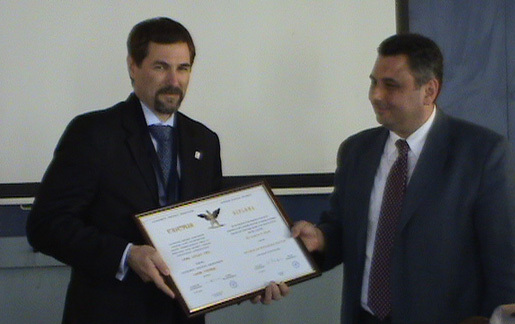 Service Agency of the Ministry of Finance of Georgia presented the Academy with training ship in February, 2010. 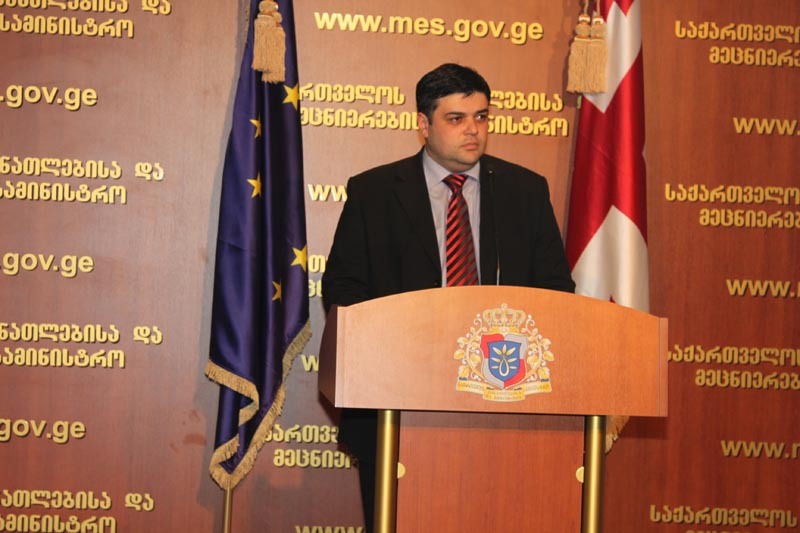 Head of General Inspection of the Ministry of Education and Science, Irakli Andriashvili held a briefing on violation of law by political parties for holding pre-election campaign in public schools. 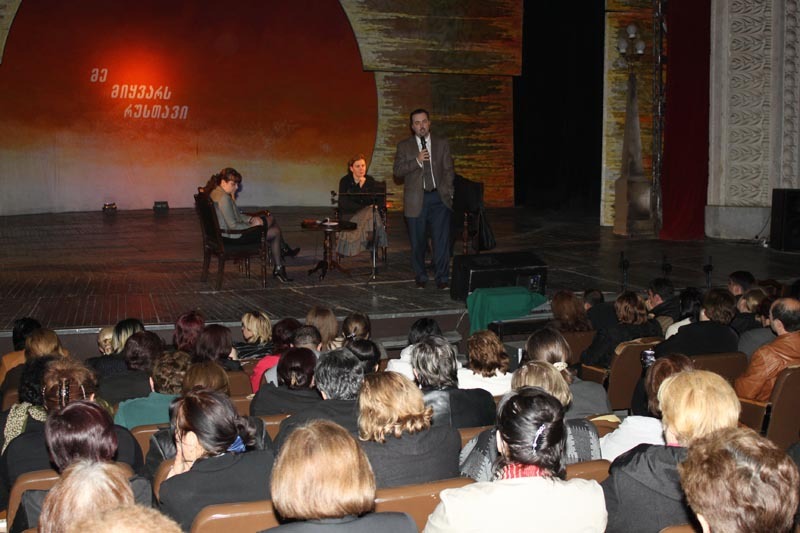 Minister of Education and Science, Dimitri Shashkini introduced ongoing educational processes and 2010-2011 planned innovations to around 200 teachers in Poti Public School №2. Refurbishing Public School Canteens in compliance with modern standards still continues. 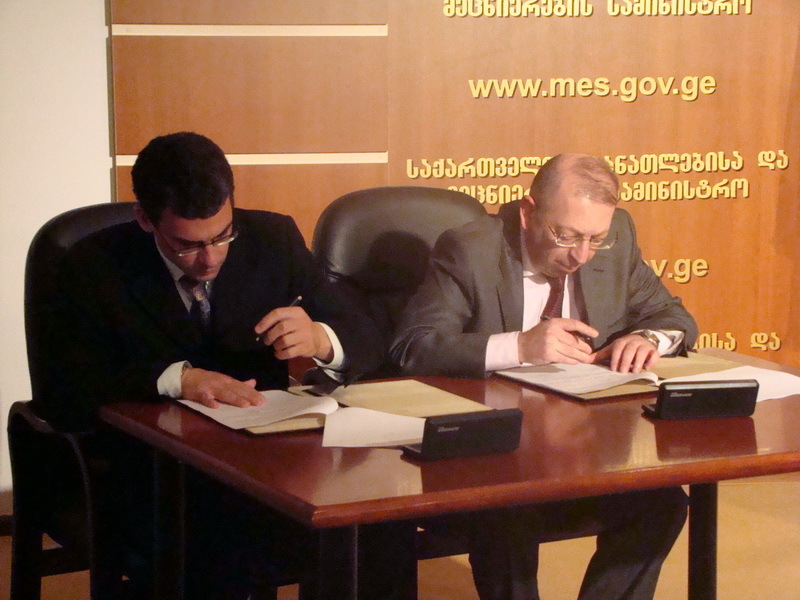 New project will be piloted in Tbilisi Public Schools №55 and №43. Minister of Education and Science, Dimitri Shashkini and Minister of Finance, Kakha Baindurashvili opened modern canteen in Public School №43. 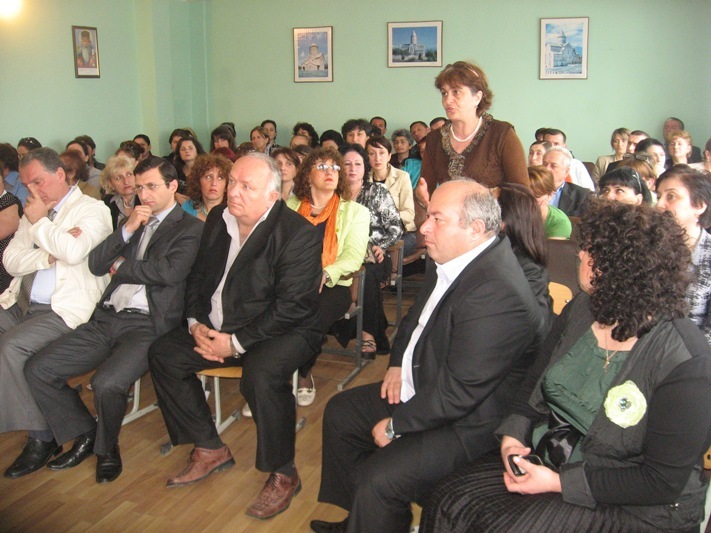 Minister of Education and Science, Dimitri Shashkini and Director of National Examination Center, Maia Miminoshvili visited Tbilisi Public School №57. Pre-testing among 11th graders is held in this school in order to define minimal competency level for 2011 General Education Exams. 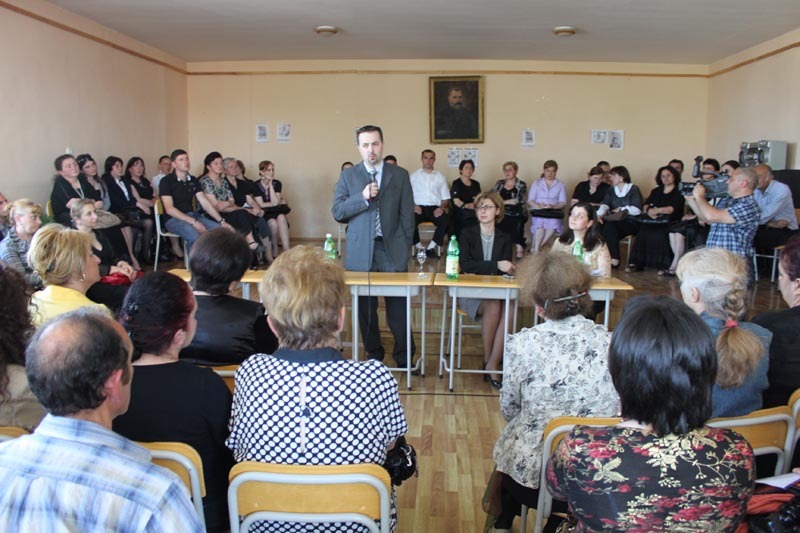 Minister of Education and Science, Dimitri Shashkini met with regional teachers in Ozurgeti Public School №2 and spoke about ongoing educational process, planned and already implemented activities in the scope of the reforms. Minister of Education and Science, Dimitri Shashkini paid a visit to newly refurbished Kheltubani Public School of Gori region.The school was rehabilitated in the framework of five-year program, that was financed by USAID. Organization CHF International Georgia implemented construction workings. 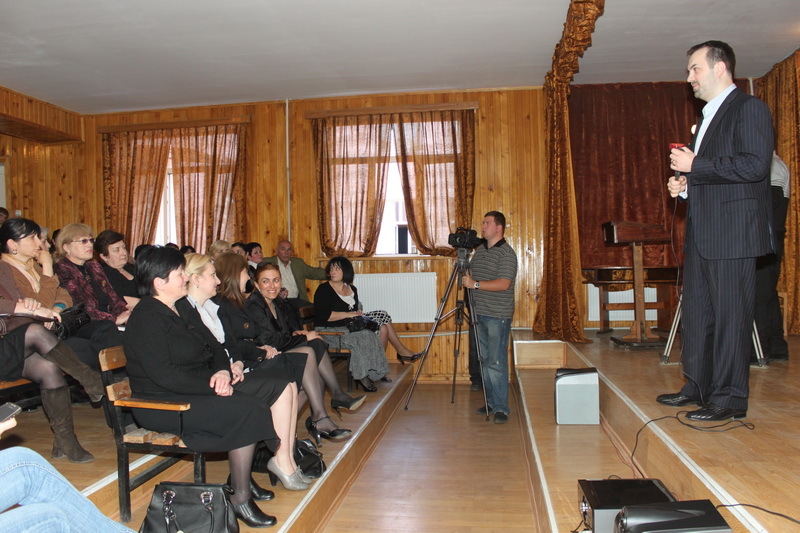 Minister of Education and Science, Dimitri Shashkini opened English Language Classroom in Tserovani Public School №3. Classroom was refurbished and equipped in the framework of English Language Learning Strengthening Program. From now on, the schoolchildren of Tserovani Public School №3 will study foreign languages using the modern informational technologies. 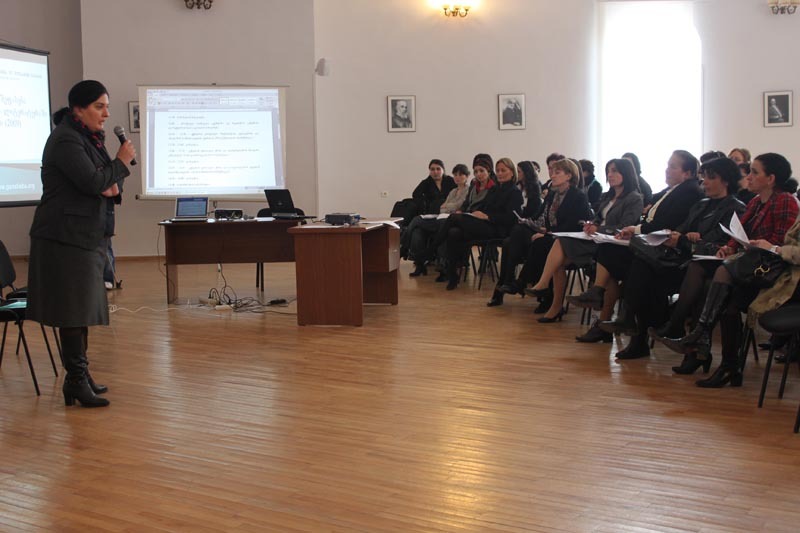 Draft plan of teachers’ professional ethics code was discussed at the meeting of the representatives of NGOs at the Ministry of Education and Science. 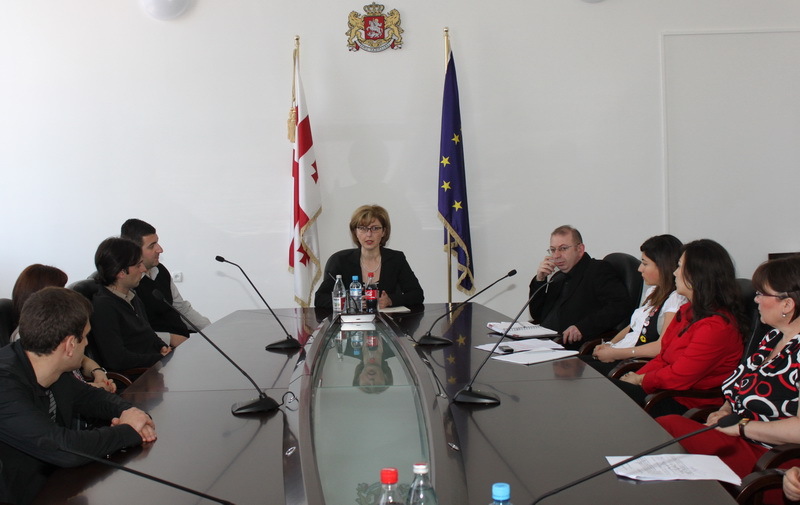 Deputy Minister, Irine Kurdadze, Head of Teacher Professional Development Center, Gia Mamulashvili and the representatives of this center participated in the meeting. 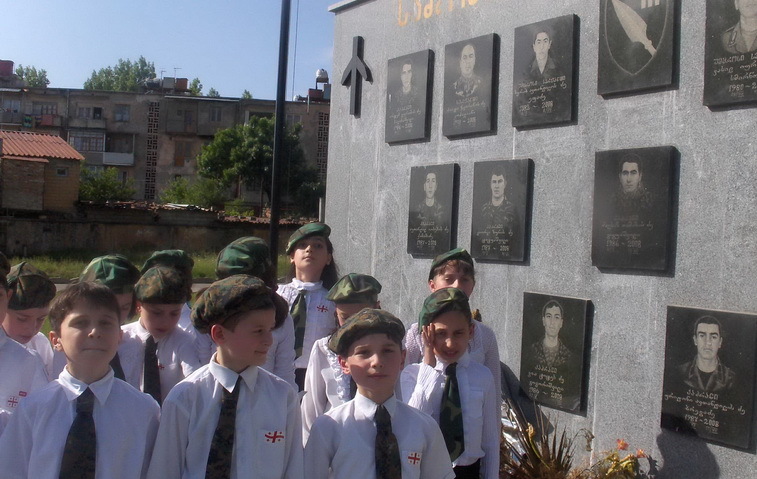 4th graders of Kutaisi Public School #17 visited Kutaisi Third Infantry Brigade of the Ministry of Defence in the framework of Goodbye Weapon project. 4000 soldiers of Third Infantry Brigade hosted the schoolchildren and familiarized them with military rules and daily schedule. Award ceremony of the winners of International Young Inventors Project Olympiad was held at the Ministry of Education and Science. The President of Georgia, Mikheil Saakashvili awarded 123 winners of Olympiad with prizes. 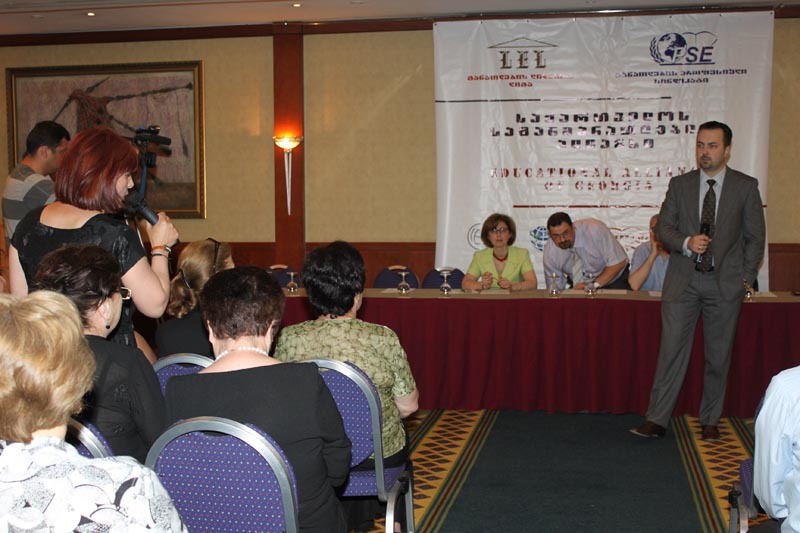 3 non-Georgian participants were presented with portable computers as well. In the framework of ongoing educational reforms, the MES began refurbishing school canteens in compliance with modern standards. The first canteen was renovated in Tbilisi Public School №55. The President of Georgia, Mikheil Saakashvili and the Minister of Education and Science, Dimitri Shashkini personally opened this canteen. 7th-12th graders of around 30 countries participate in International Olympiad that is held in Georgia. Competent jury will evaluate participants’ projects in mathematics, physics, chemistry, biology, informatics, ecology as well as industry and household techniques and identify the winners. 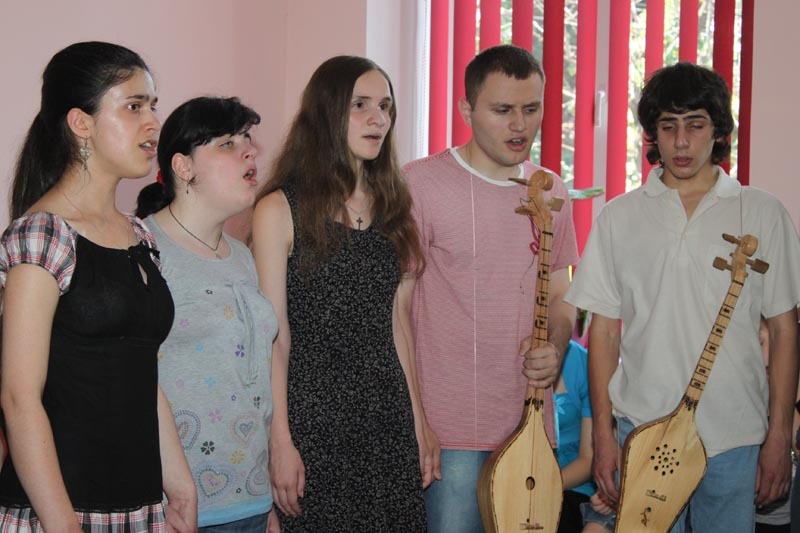 Two-day Olympiad was opened in “Sheraton Metechi Palace” on May 13. 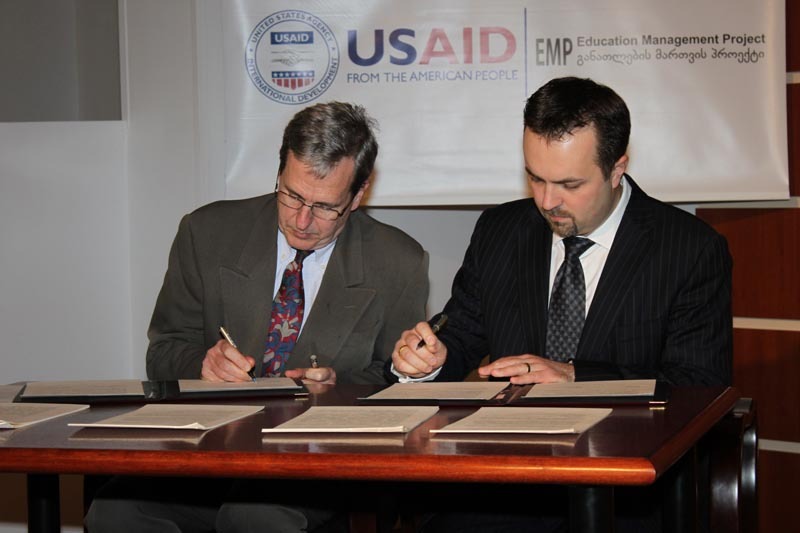 Dimitri Shashkini and the Mission Director of United States Agency for International Development (USAID) Jonathan M. Conly signed Memorandum of Understanding on the development and deployment of Student Information System (SIS). Minister of Education and Science, Dimitri Shashkini and Director of company “Neotek” , Igor Parjiani visited Public School #117. “Neotek” responded to Safe School program, that is initiated by the Ministry and installed 16 video cameras in this school free of charge. Two cameras are installed outward of the school perimeter. 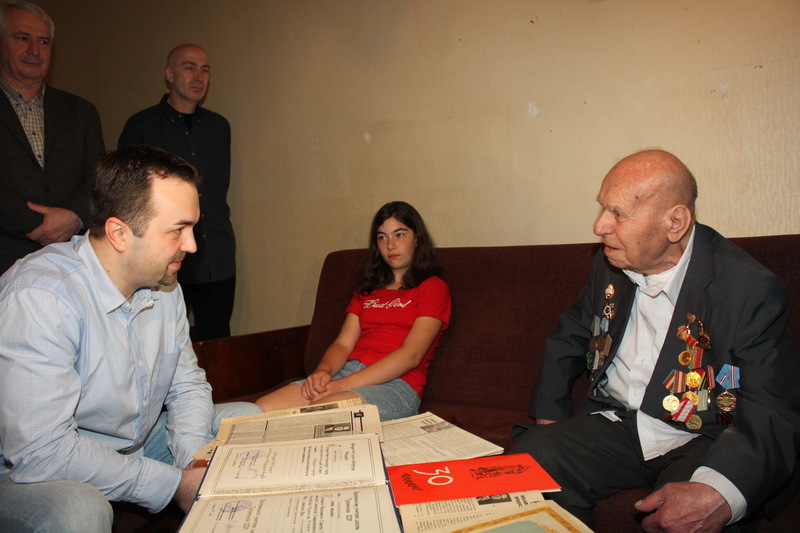 Minister of Education and Science, Dimitri Shashkini personally congratulated Veteran teacher, Gabriel Gabitashvili on the Day of Victory over Fascism – 9 May and presented him with different gifts. 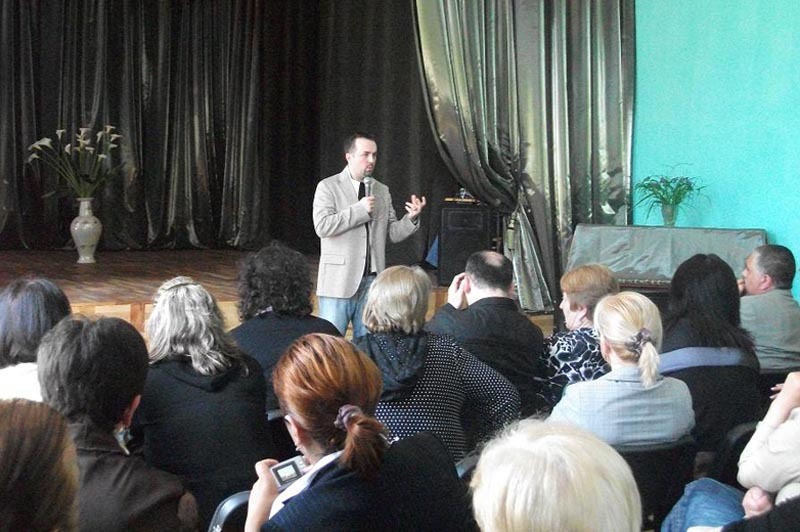 The Minister congratulated on May 9 all Veteran teachers and wished them a healthy life. Ministry of Education and Science announced a competition for scholarships on Master’s programs at leading higher educational institutions of the world. 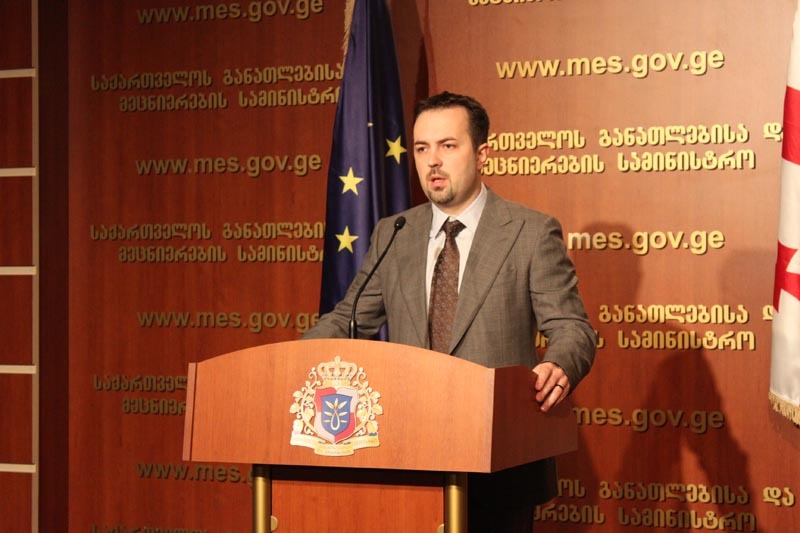 Georgian citizens under 40, who have Bachelor’s degree and are already enrolled in higher educational institutions that are listed on the web-site of the Ministry can participate in the competition. Around 30 12th graders of Mtskheta Public School №2 visited Vaziani military base in the scope of Civil Defence and Safe School programs. Soldiers of Forth Infantry Brigade hosted them. Adults inspected military techniques, got familiarized with the training courses of the soldiers and their equipment. 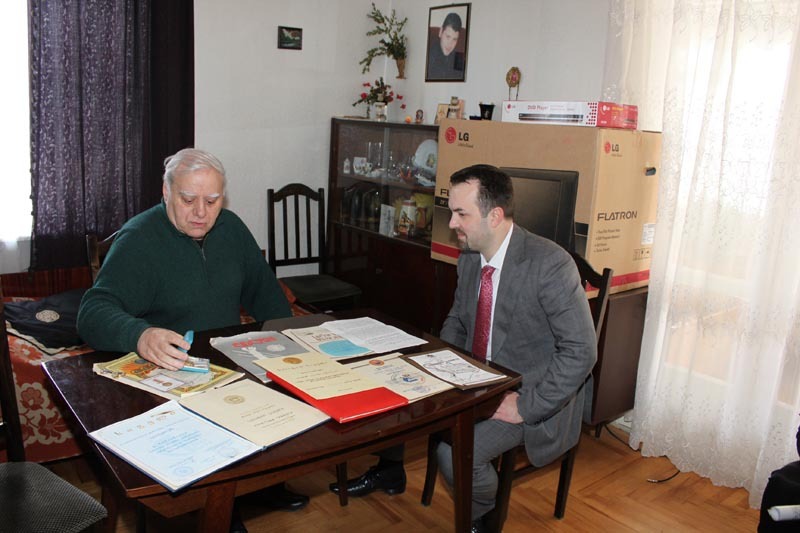 Minister of Education and Science, Dimitri Shashkini visited the merited teacher of Tbilisi Public School №203, Mr. George Zubiashvili at home, wished him a happy St. George’s Day and presented with different gifts. 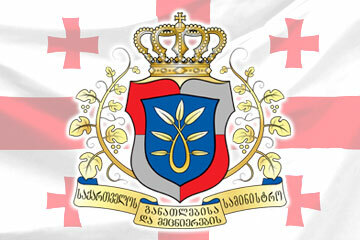 The Minister congratulated on St. George’s Day all teachers, particularly the men named George and wished them success. The Ministry of Education and Science and the Teacher Professional Development Center announces competitions on new programs - Teach for Georgia and Qualified Teachers in the regional schools of Ethnic Minorities. 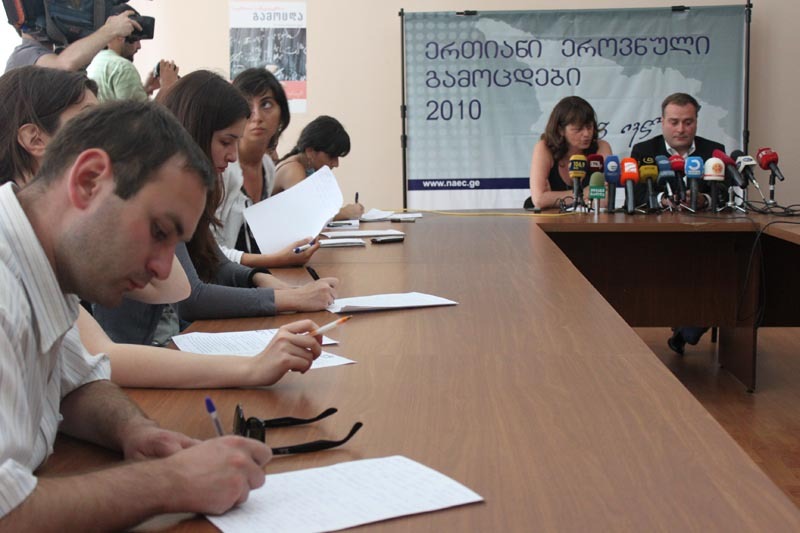 Subject matter specialists and experienced teachers of Georgian Language and Literature can participate in the competition. Registration for Graduate Record Examinations will finish on May, 10. The First Deputy Minister, Akaki Seperteladze and the Director of National Examination Center, Maia Miminoshvili held a briefing on priority directions and principles of student funding. 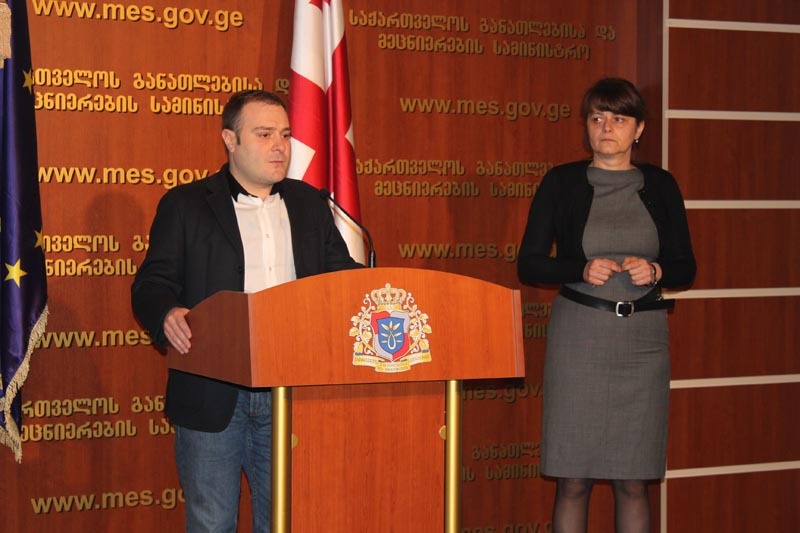 The Minister of Education and Science of Georgia, Dimitri Shashkini and the Executive Director of Medical Insurance Group “Archimedes Global Georgia”, Rusudan Lagvilava presented with the health care insurance policies 22 guards, being working in 7 pilot schools. Following schedule is provided for the first selection rounds for international Olympiads in mathematics and physics that will be held at Tbilisi public school №98: the first and the second rounds in physics and mathematics will be held on May 1and 2, third and the fourth rounds – on May 12 and 13. The Heads and the representatives of the Embassies accredited in Georgia and international organizations got familiarized with the ongoing educational reforms, challenges and initiatives for 2010-2011. 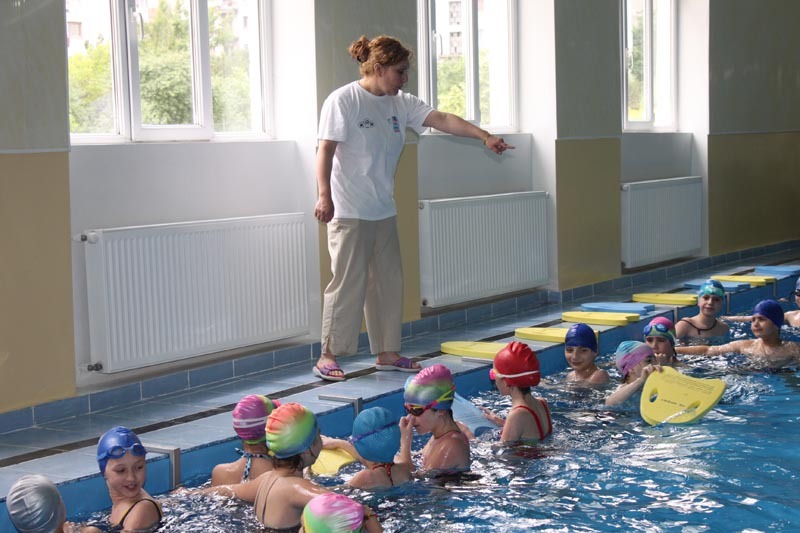 The Minister of Education and Science, Dimitri Shashkini opened the new swimming pool in Tbilisi Public School №94. This swimming pool is the only one in this settlement of Isani-Samgori. The Schoolchildren of 7 public schools will use this swimming pool with some privileges. The memorial board of the heroes, Kakhaber Tavgorashvili and Vakhtang Gzirishvili, died in Russian-Georgian war was opened in Rustavi public school №7. 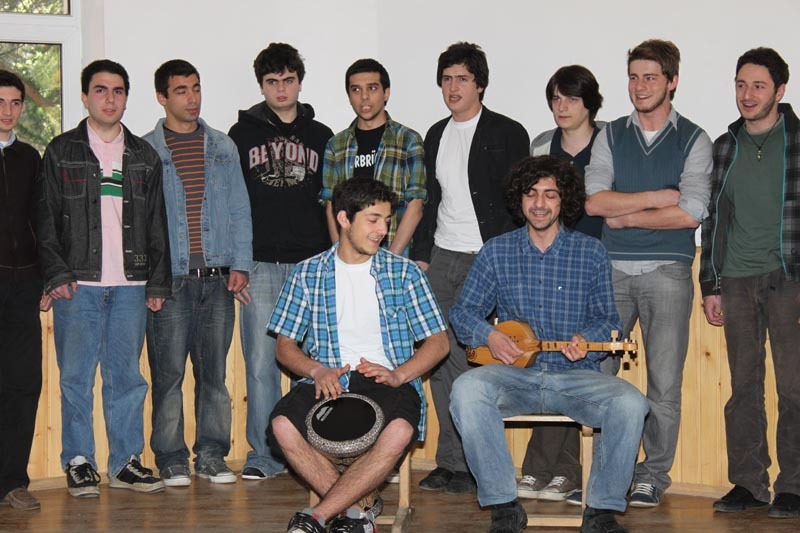 An American organization Peace Corps successfully implements recruiting volunteer native English speaker teachers in Georgia in parallel with the project Teach and Learn With Georgia. 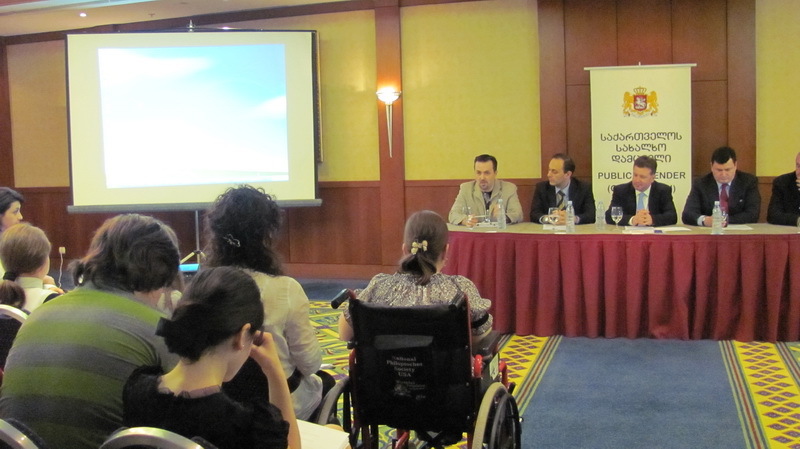 Publishing the results of Alumni Club – the club of successful graduates, initiated by the president is underway. 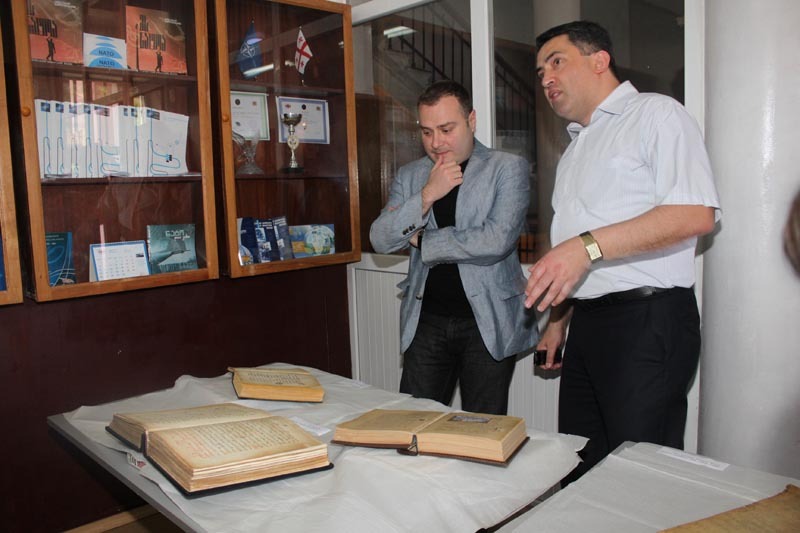 In the framework of this project, the Minister of Education and Science, Dimitri Shashkini and the Minister of Sport, Monument Protection and Culture, Nikoloz Rurua visited Telavi public school №1 and introduced the results of Alumni. The first results of the Alumni project, initiated by the President are already known. Alumni club is the club of successful graduates. 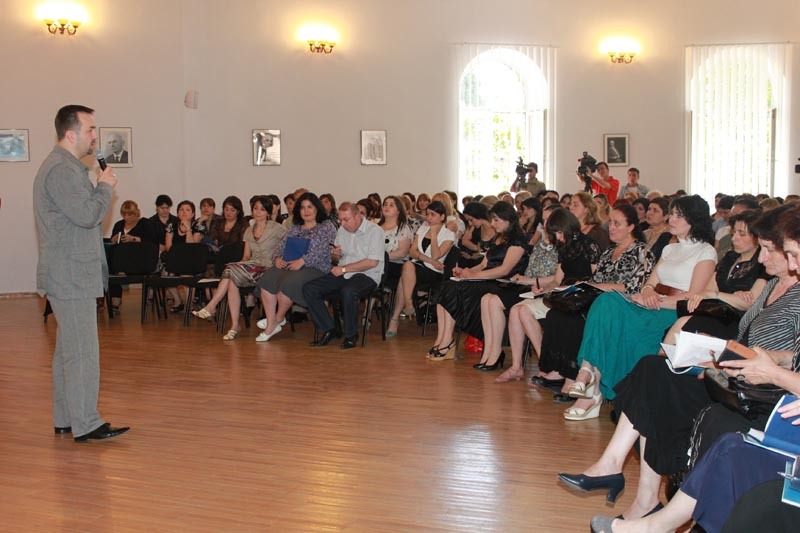 The Minister of Education and Science, Dimitri Shashkini introduced the first results to the teachers, the schoolchildren and the members of Alumni club at the meeting, held in Tbilisi public school №1. 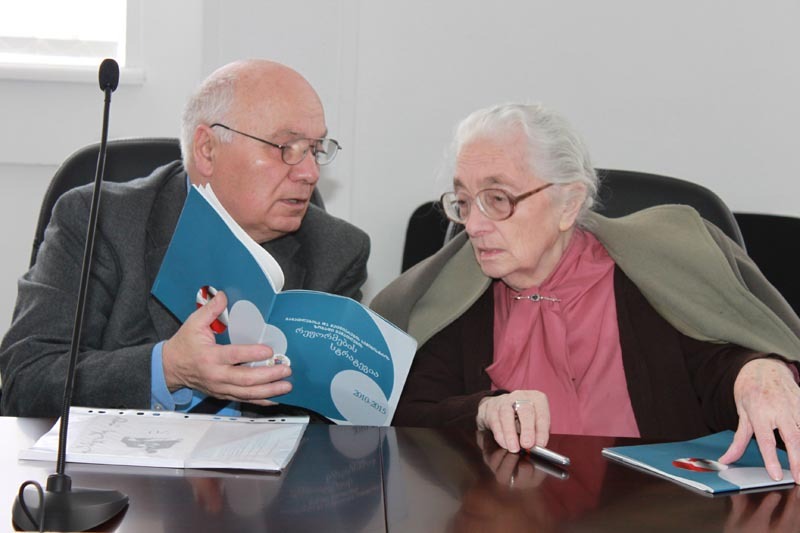 9th graders’ knowledge and abilities in Georgian language and literature were developed according to the National evaluation, carried out in public schools of Georgia. 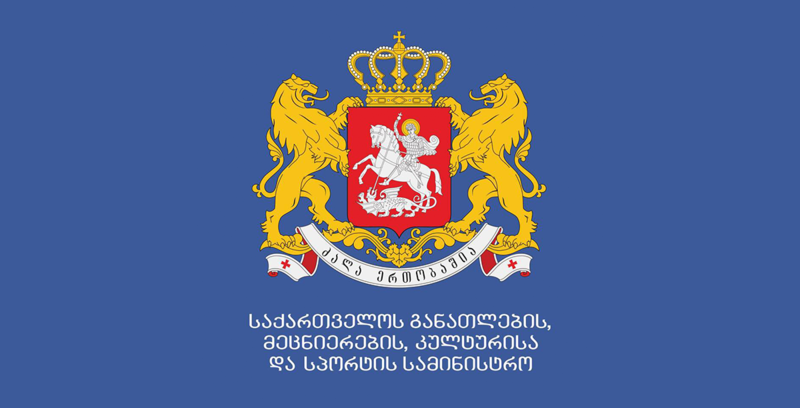 The Ministry of Education and Science of Georgia announces the competition for the selection of public school guards. Interested candidates of 20-45 ages can participate in the competition. The Minister announced the competition at the Academy of the Ministry of Internal Affairs during his meeting with the guards, schoolchildren and their parents. The Minister of Education and Science, Dimitri Shashkini presented with portable computers the winners of Europe school competition, held in Salonika (Greece). 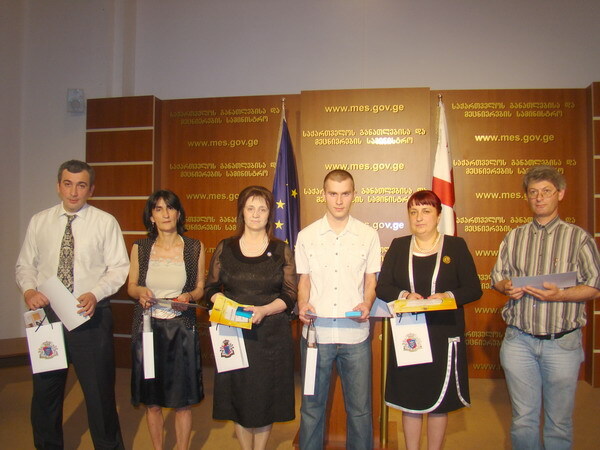 Three winners among four are the schoolchildren of Kutaisi public school №21. 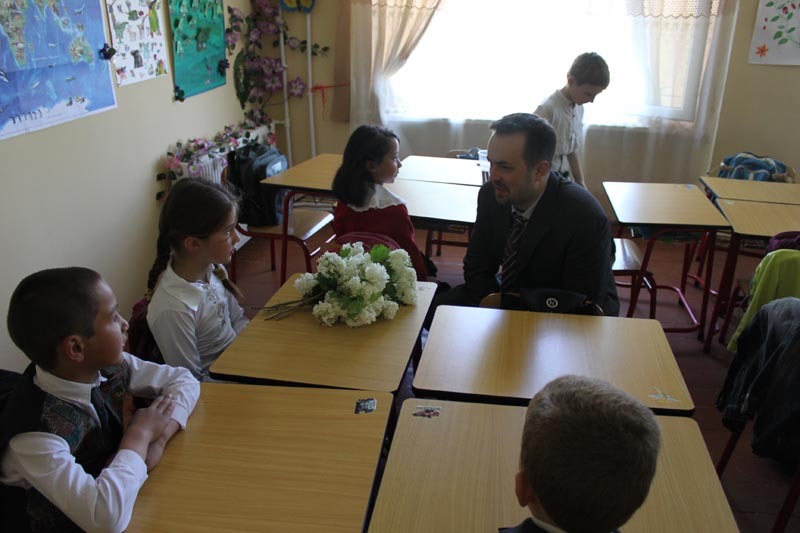 The First Deputy Minister, Koka Seperteladze visited Tbilisi public school №23 in the framework of the International Day of Book. He supplied the school library with different literature as well as the collection of children literature of Georgian writers. The Minister of Education and Science, Dimitri Shashkini opened the new carpentry enterprise at the Vocational Education and Training Center “Spectri” and attended the making process of the first product – laminate, using the furniture making machinery. 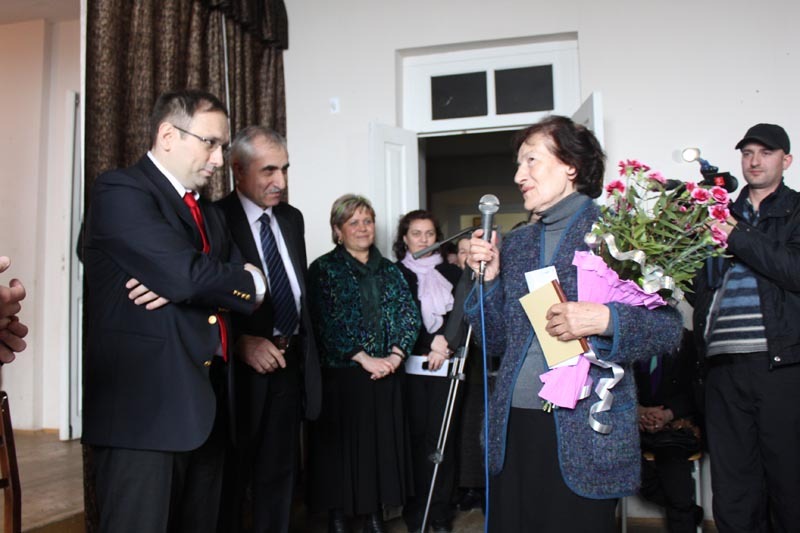 Tbilisi D. Uznadze public school №22 celebrated the sixtieth anniversary. The school responded to the President’s initiative of the Alumni project and established the club of successful graduates. The artist Murman Dginoria, attended the event as the graduate of this school. By the President’s initiative, the physical culture classes will be replaced with the sports lessons at public schools from the next academic year. The Ministry of Education and Science of Georgia recommends to all public school administrations not to allow pre-election campaigns on the school premises during the school process as it can hinder the educational process. 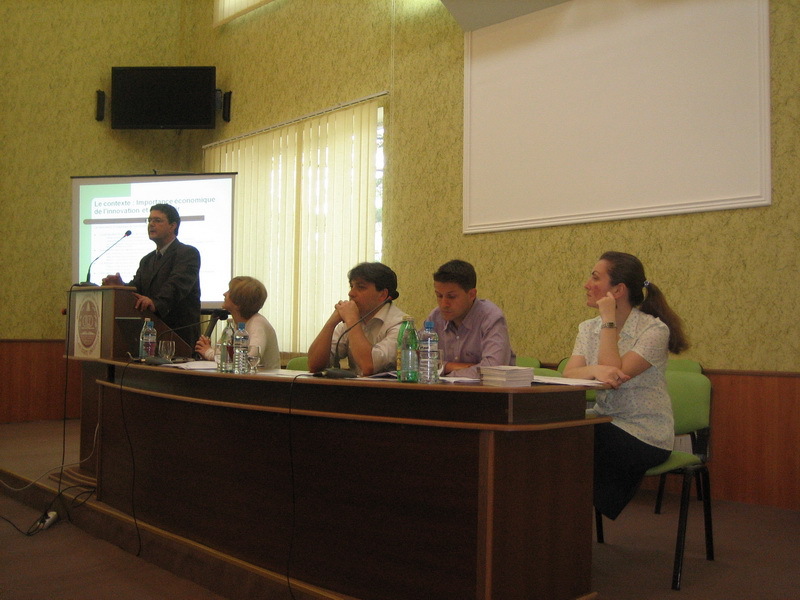 The third final round of the competition the Best Linguist was held in Kutaisi public school №17, on April 19, 2010. 56 schoolchildren participated in it.